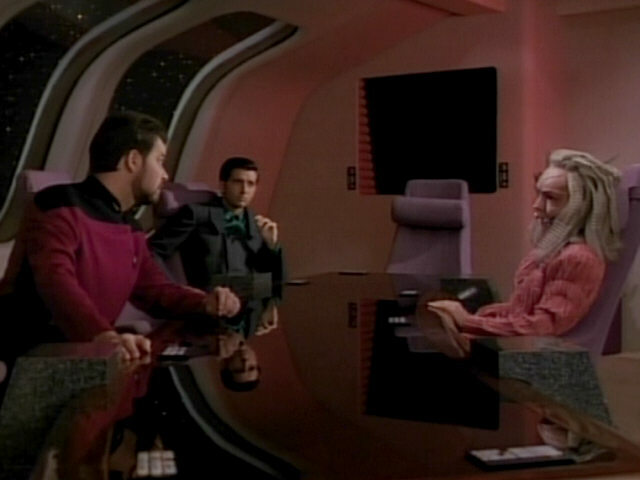 Ex Astris Scientia - Observations in TNG: "The Price"
Here are some observations about sets, props and visual effects in TNG: "The Price" without a specific theme, and a comparison of the original TV release (TNG) with the remastered episode (TNG-R). 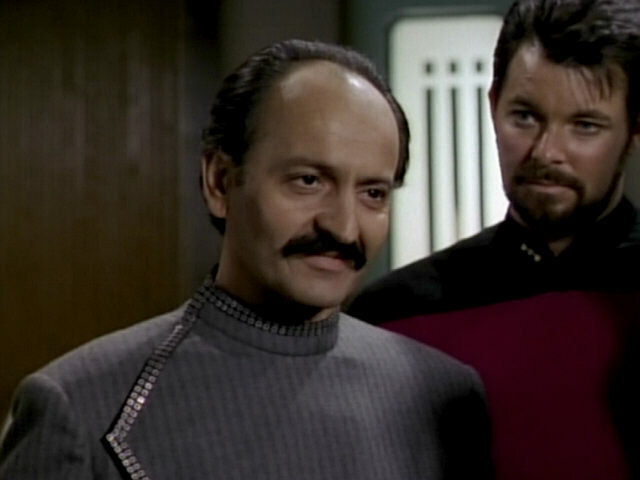 The stripes and collar of Seth Mendoza's costume are made from the same material as the 21st century military uniforms seen in "Encounter at Farpoint" and the Ferengi headgear, seen in "The Last Outpost" and "The Battle". 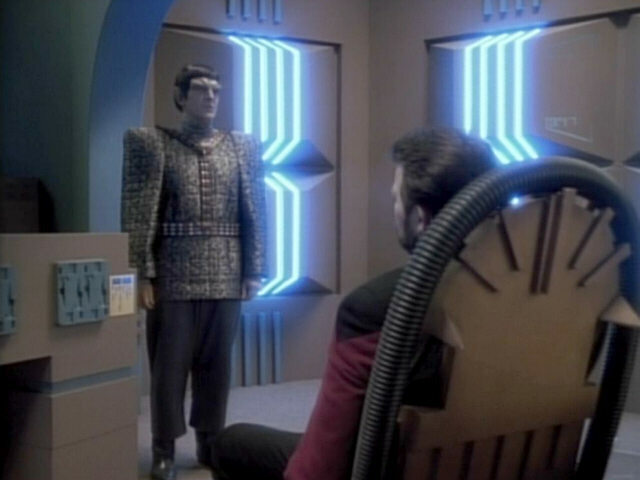 Outpost" A closer look at the costume in HD. 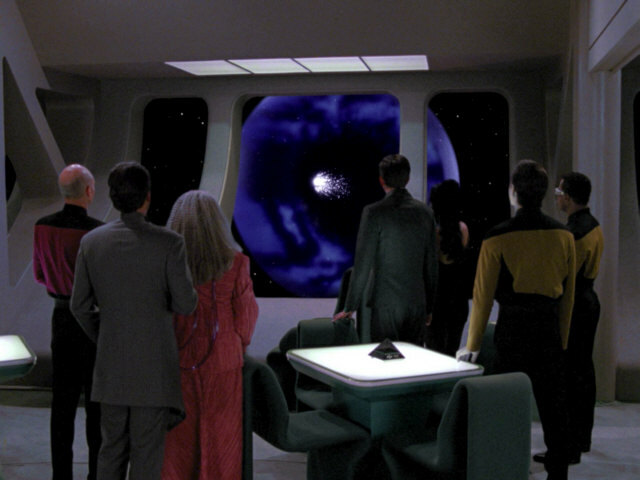 The Barzan wormhole as seen through the Ten Forward windows. 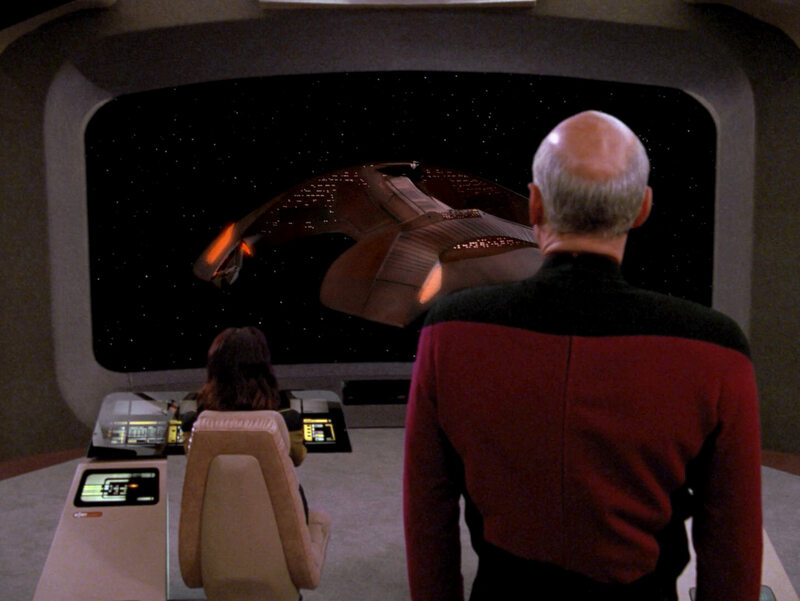 The effect looks practically identical in TNG-R. 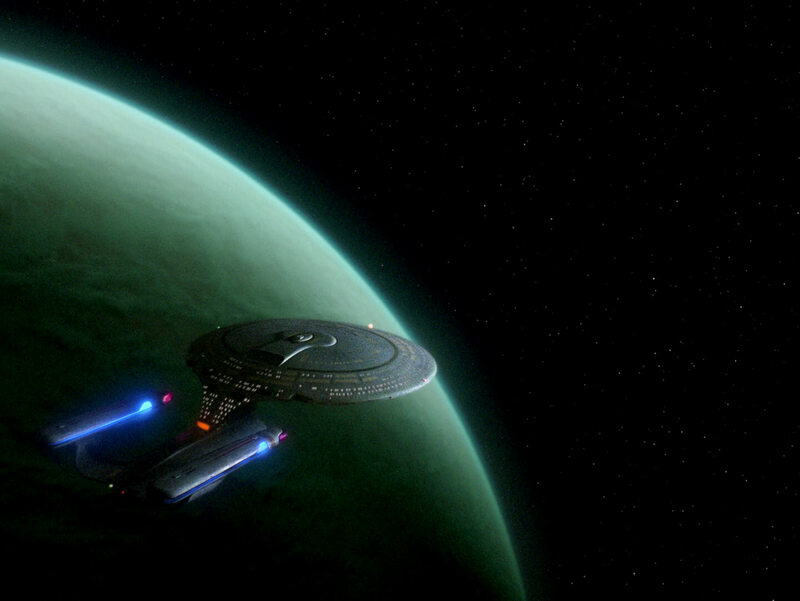 The USS Enterprise-D in orbit of Barzan II. 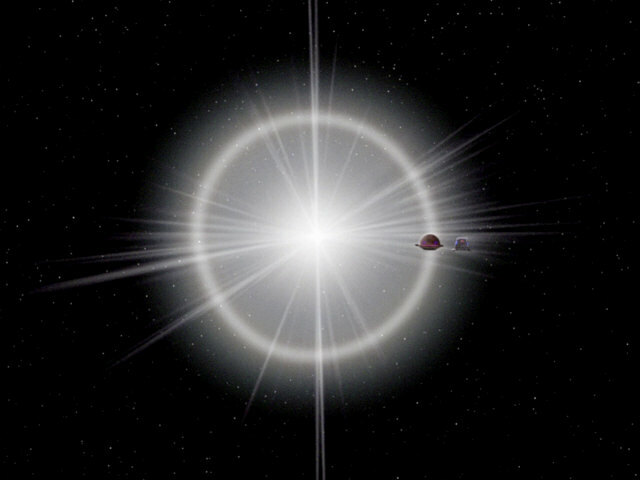 The planet is a re-use of Gagarin IV from "Unnatural Selection". 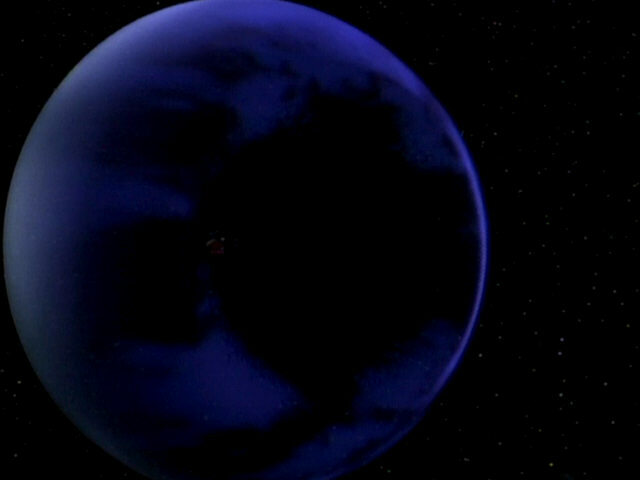 Re-Used Planets in TNG A new planet appears in TNG-R. 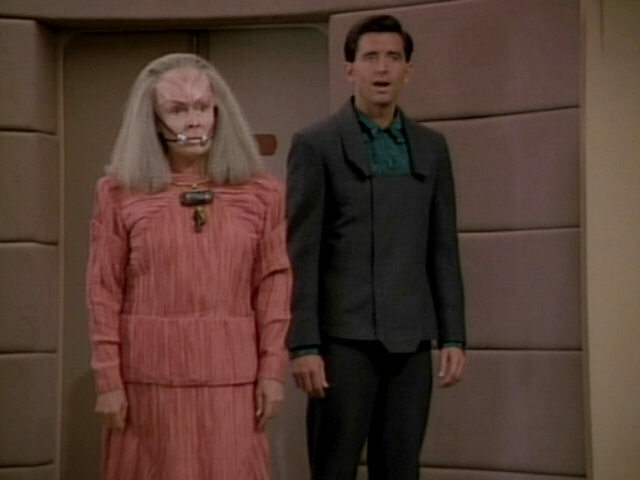 It is unclear whether it is the very same as in TNG-R: "Unnatural Selection". 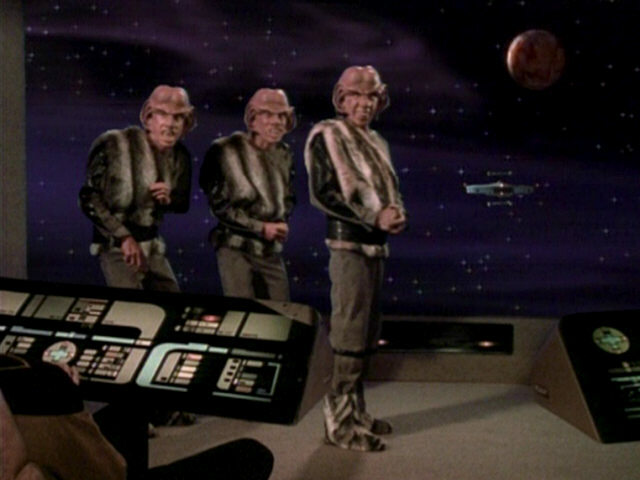 The new Ferengi uniform, introduced in season 2's "Peak Performance", can be fully seen on this screen cap. 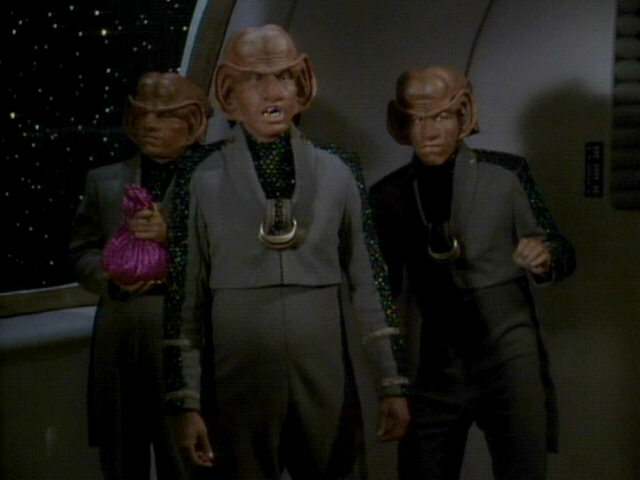 The Ferengi look more respectable with this uniform than they did with the furry clothing seen in season 1. 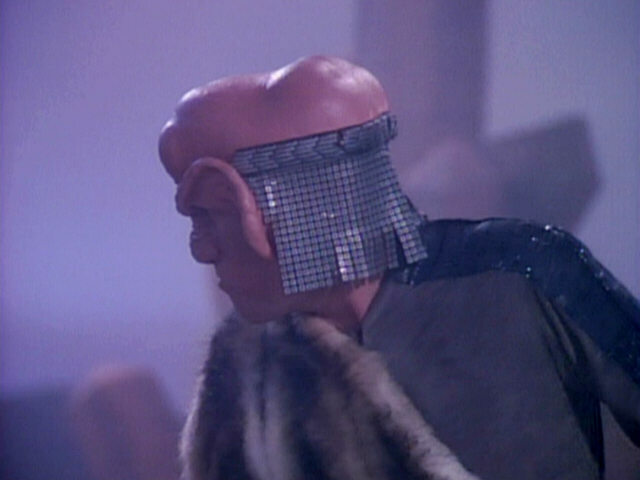 The lower part of the new Ferengi headgear is made from a different, more colorful material but the top rim is still made from the same material as in season 1. 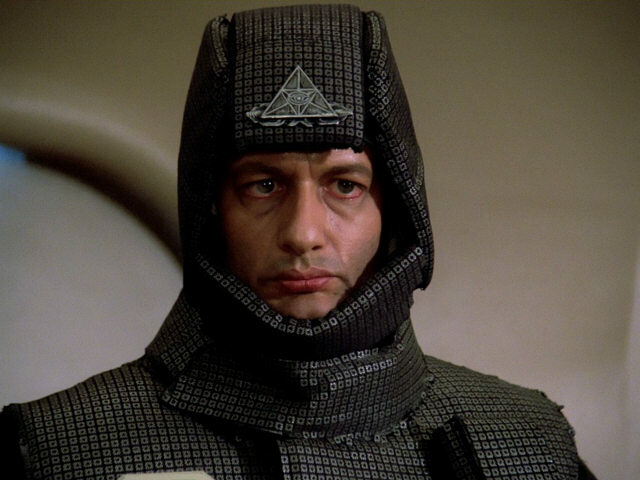 That part of the headgear is no longer silver but gold now, however. 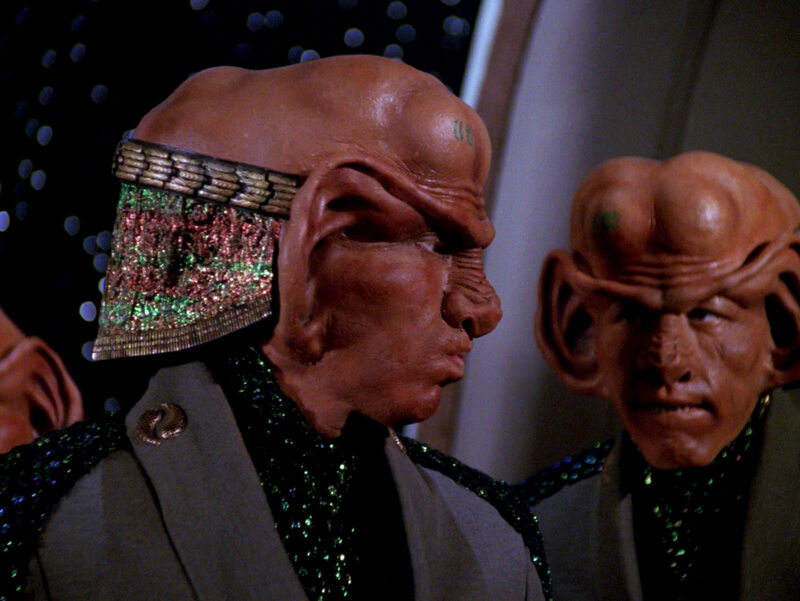 The Ferengi rank insignia can be nicely seen in this screenshot, too. 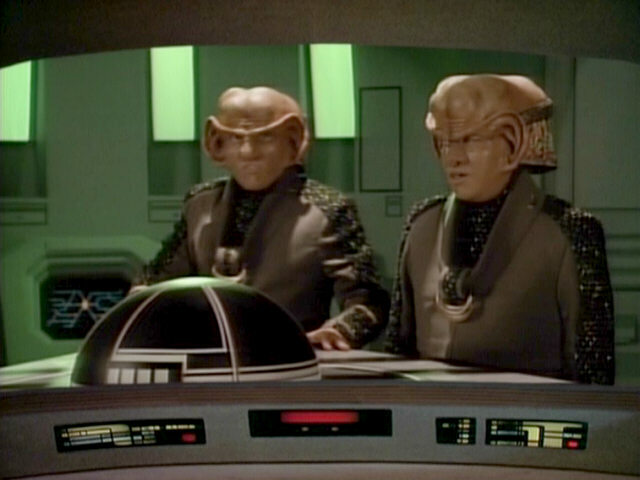 Outpost" A better look at the Ferengi headgear and uniform in HD. 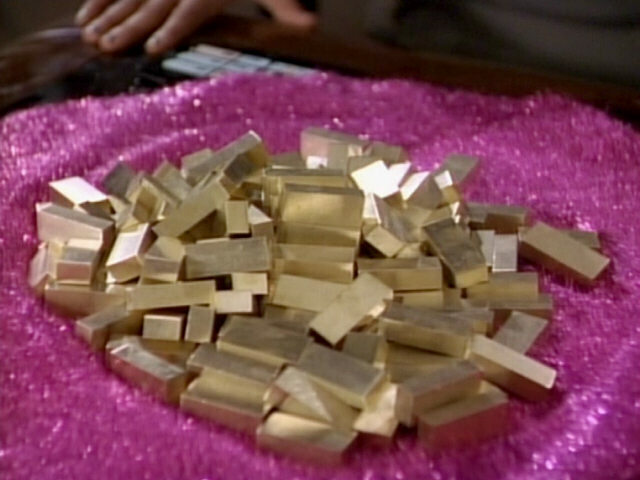 As gold-pressed latinum hadn't been introduced yet, the Ferengi use small bars of gold to bid for exclusive rights to the Barzan wormhole. 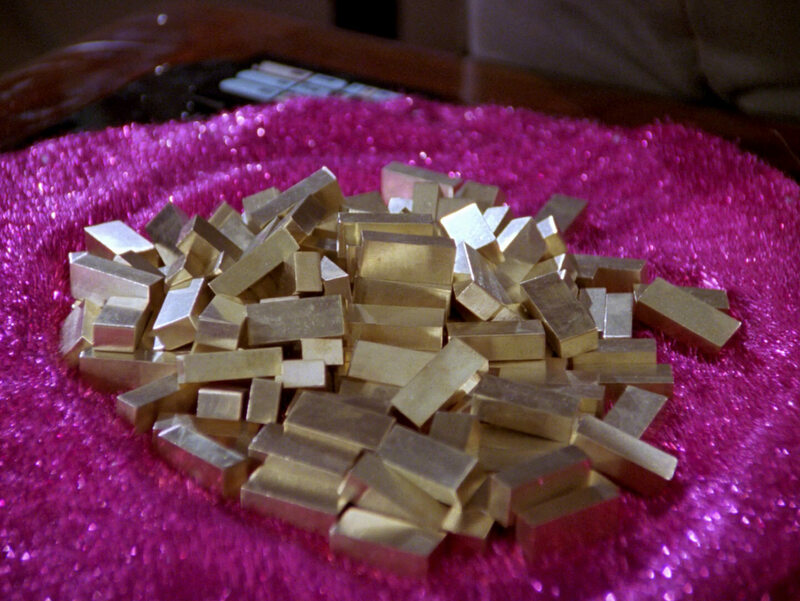 The gold bars in HD. 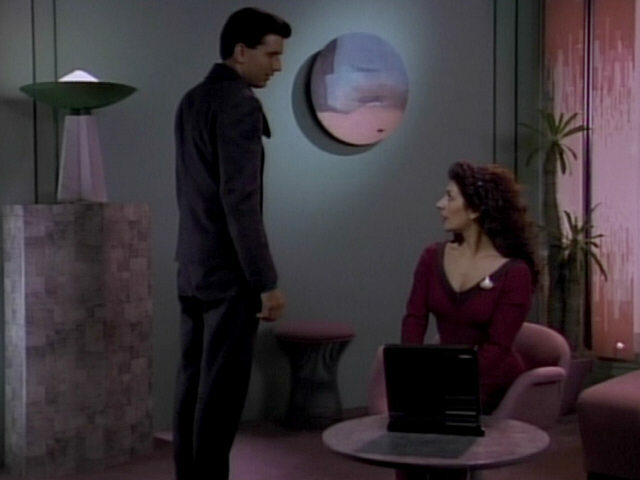 Troi reviews Devinoni Ral's biographical data on a desktop monitor in her office. 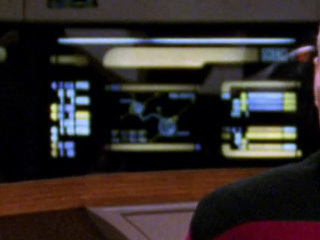 We can read almost the complete text on the display. 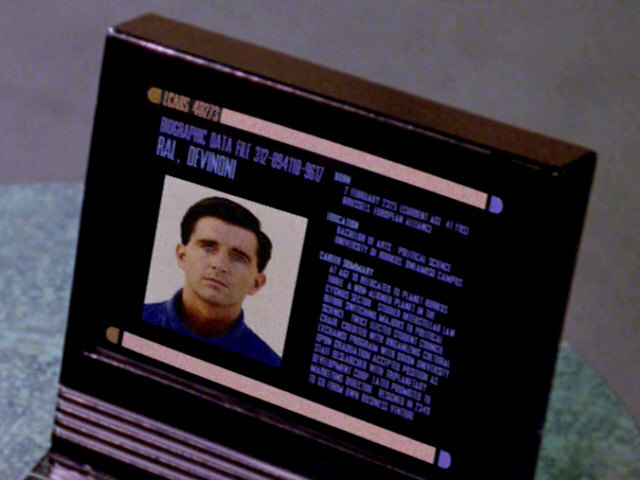 According to the file, Devinoni Ral studied at the University of Hurkos, Oneamisu Campus. 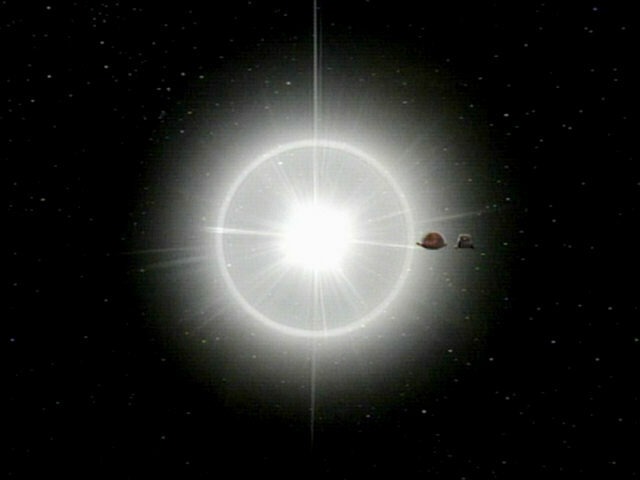 This is a reference to the anime film "Oneamisu No Tsubasa". 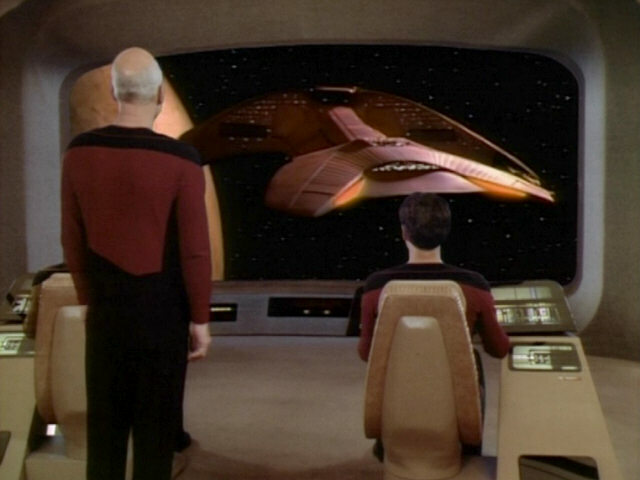 As can be seen, all in all, the set looks nearly the same as it did in season 2. 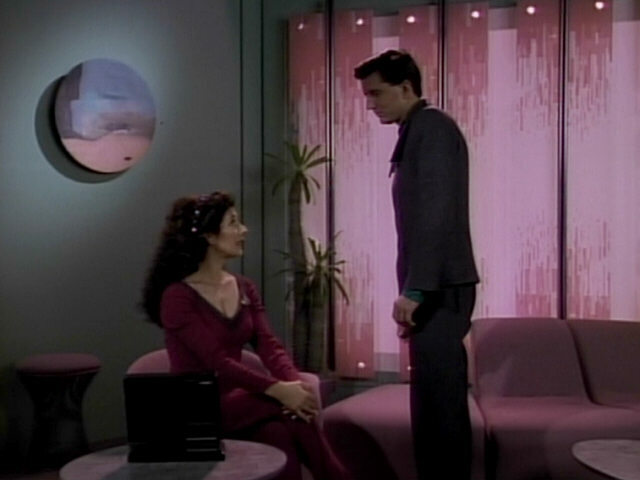 The set just seems to be a little more colorful in this episode. 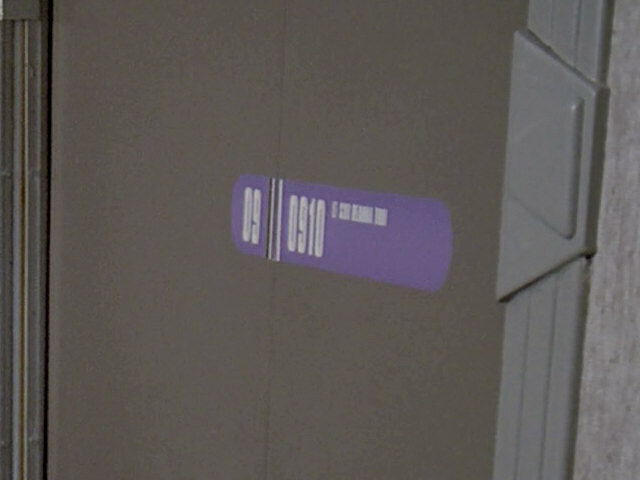 Circular pieces of wall decoration like this were last seen in the guest lounge in "The Outrageous Okona". 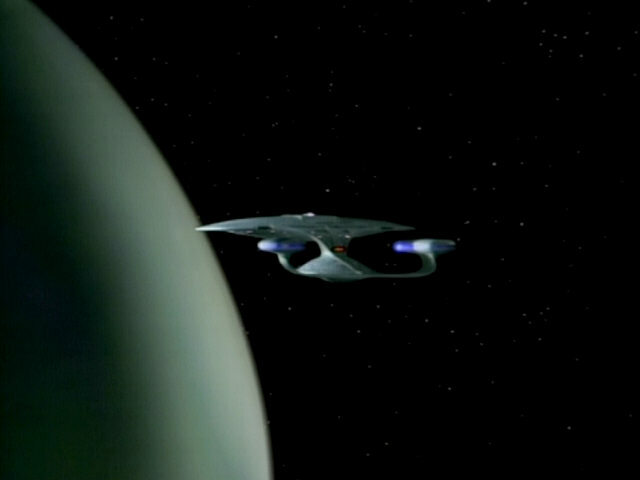 Similar round and rectangular pieces of decoration began appearing in crew quarters aboard the USS Enterprise-D in the fourth season, slowly replacing the space paintings created by Rick Sternbach. 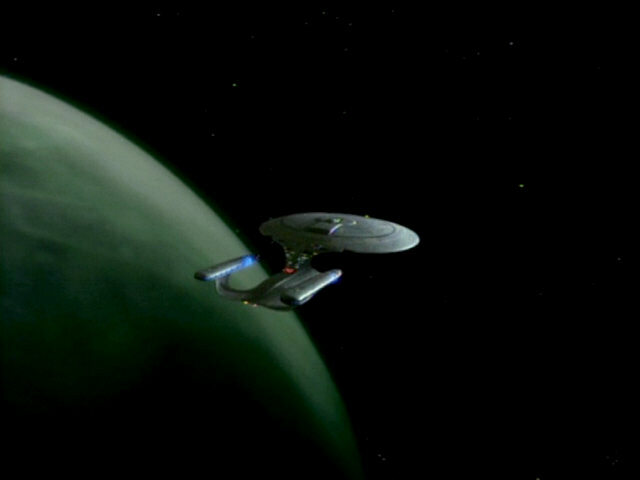 This shot of the USS Enterprise-D orbiting Barzan II also appeared in "Unnatural Selection" where the planet was Gagarin IV. 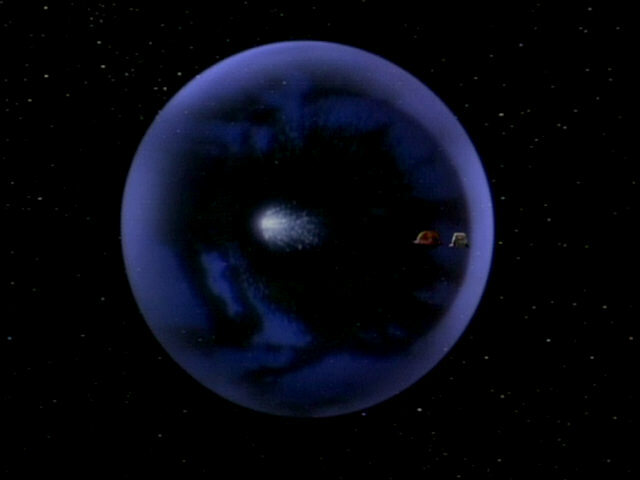 Another look at the revised planet. 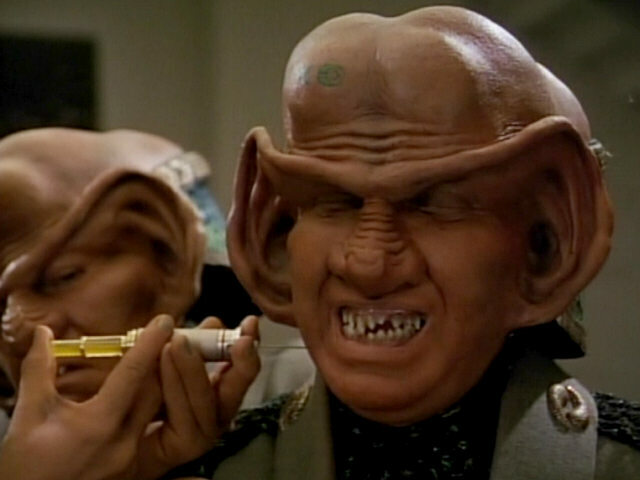 A Ferengi syringe is used to extract Ferengi blood pyrocytes. 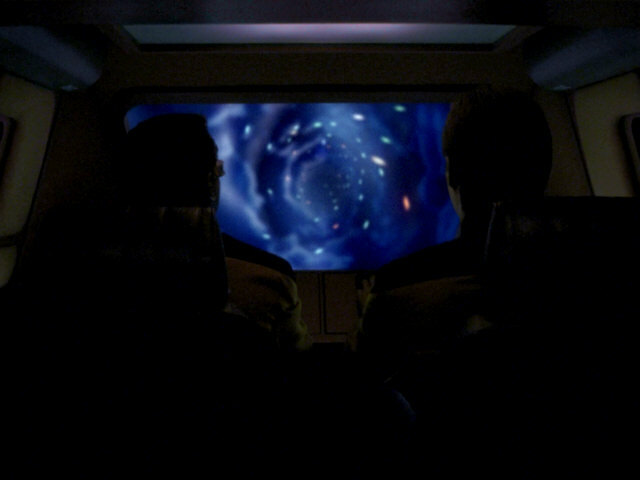 The pyrocytes seem to be yellow in contrast to Ferengi blood, which is red as seen in DS9: "The Ascent" and "The Emperor's New Cloak". 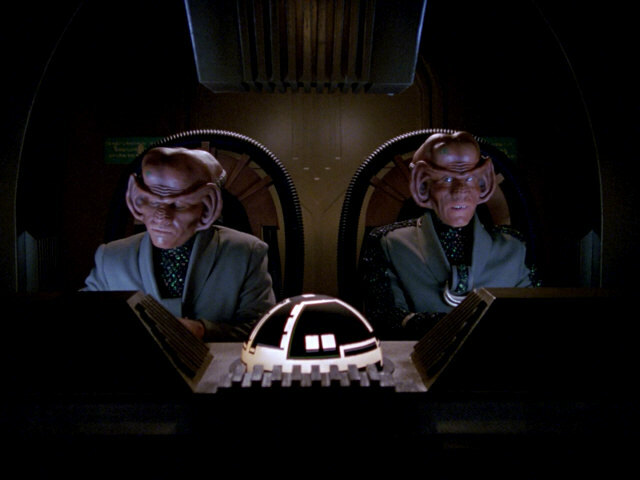 Like in "The Last Outpost", Ferengi fingernails are silvery blue. 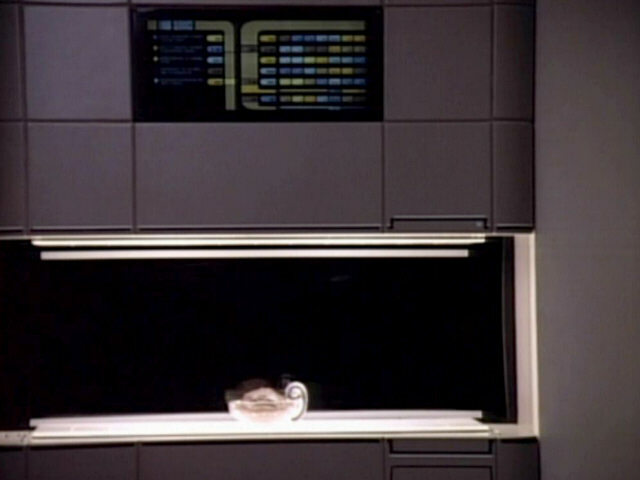 As can be seen in this shot, the color scheme of the replicator LCARS interface has changed since season 2. 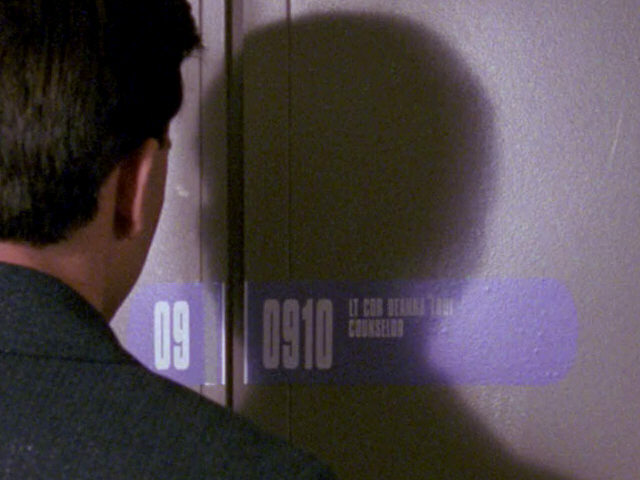 In the first two seasons, the interface was yellow/blue, now it is orange/purple. 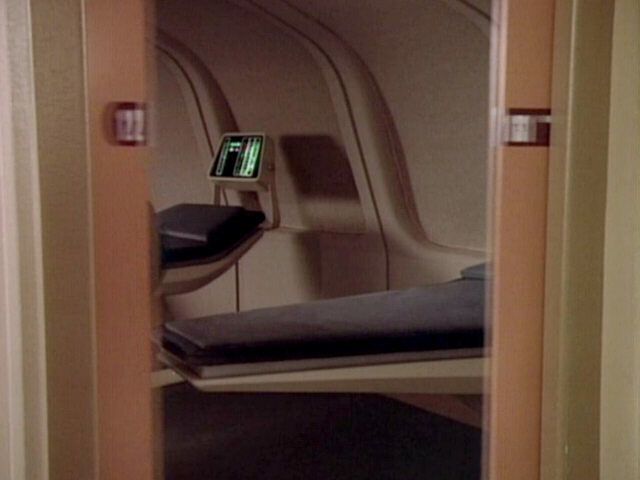 A look into sickbay from the corridor. 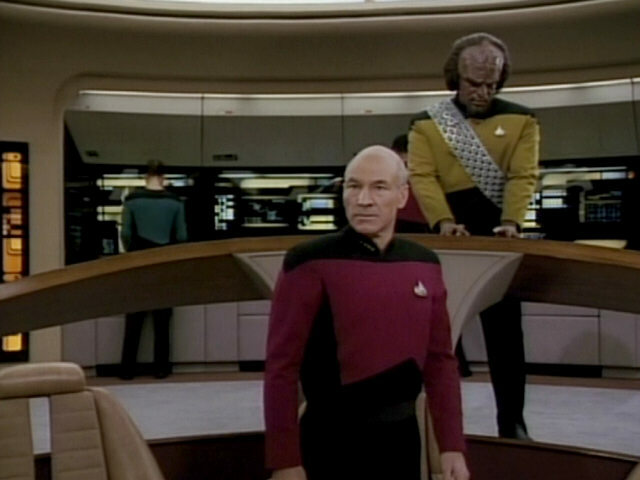 Two comparison screenshots from season 1 show what the set looked like in that season. 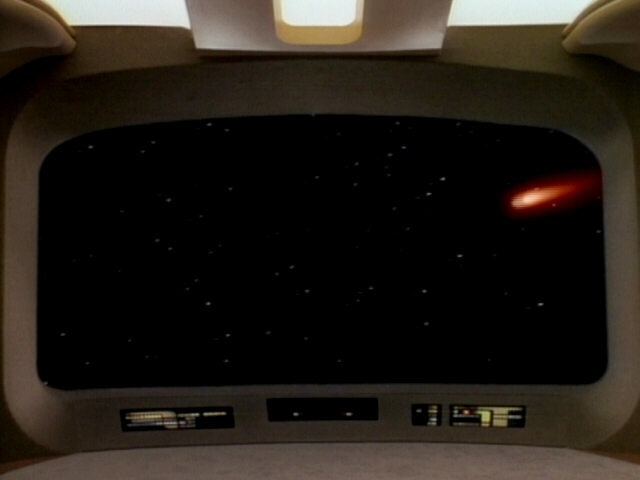 As can be seen, the back door to sickbay has been moved considerably to the left. 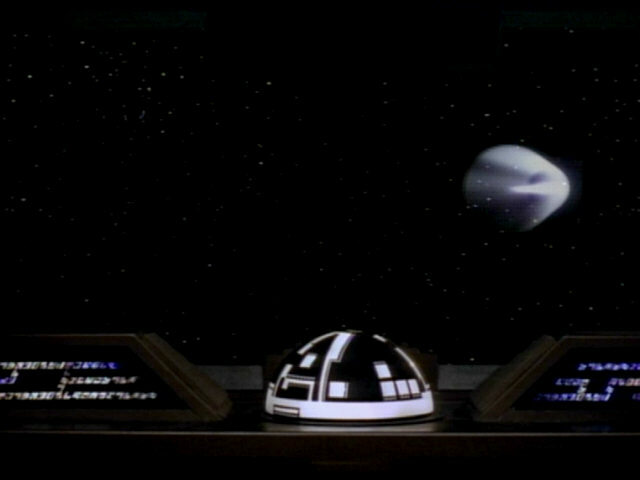 The large hole on the top of the biobed was covered with a dark plexiglass sheet with white stripes since it was last seen in "The Enemy". 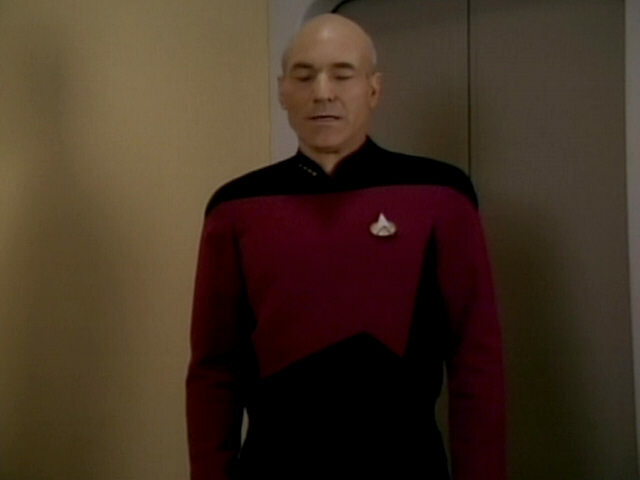 The lights in the turbolift are not turned on in this shot. The comparison screenshot from "The Hunted" shows an illuminated turbolift. 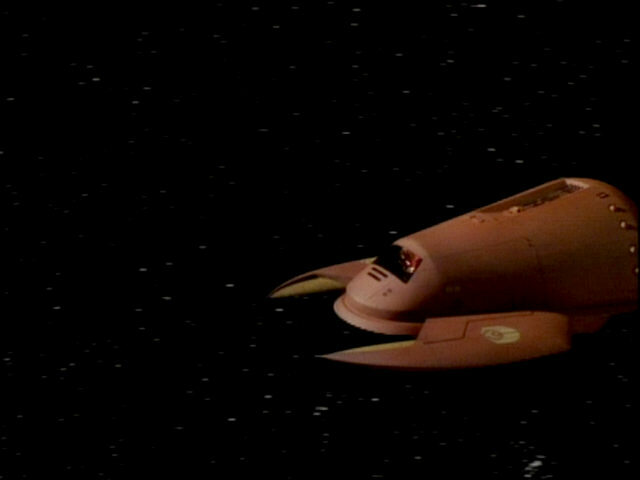 The Ferengi shuttle makes its first appearance in this episode. 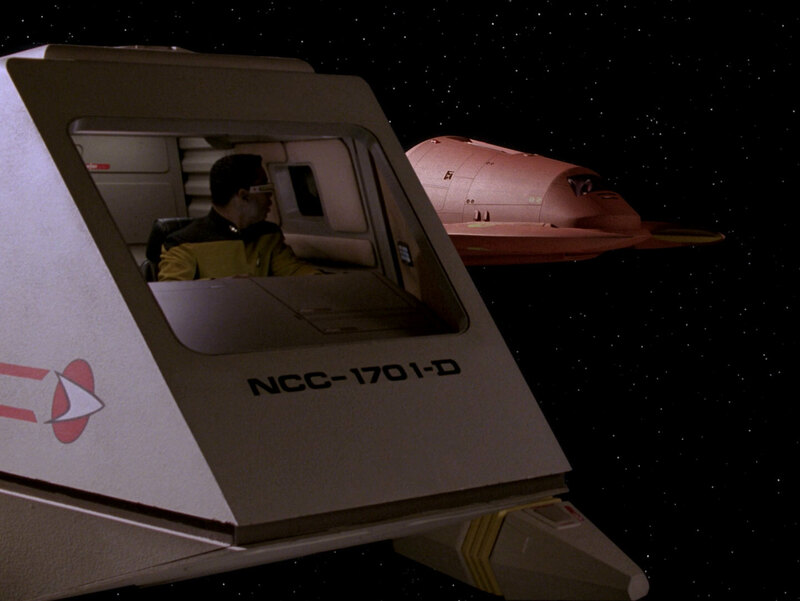 Here it is shown to be of roughly the same size as a type 15 shuttlepod. The size of the Ferengi shuttle would increase in later reappearances of the model. 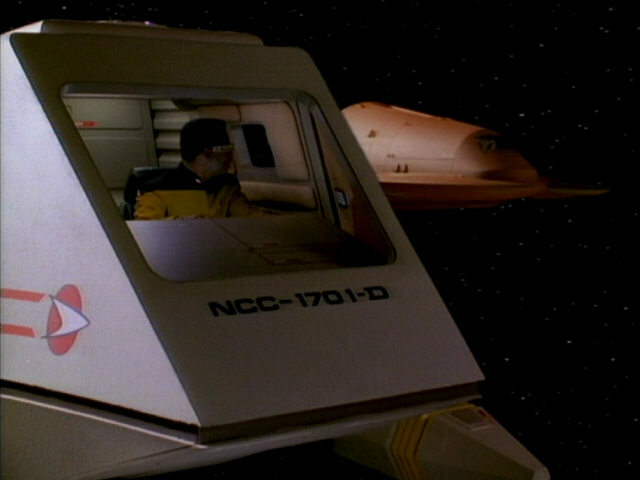 The lettering on the hull of the Federation shuttlepods has changed since its earlier appearances in "Time Squared" and "The Ensigns of Command". 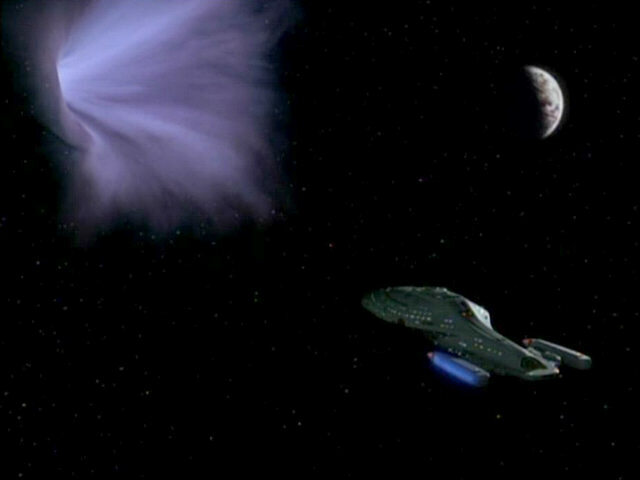 "Time Squared" The model shot looks brilliant in HD. 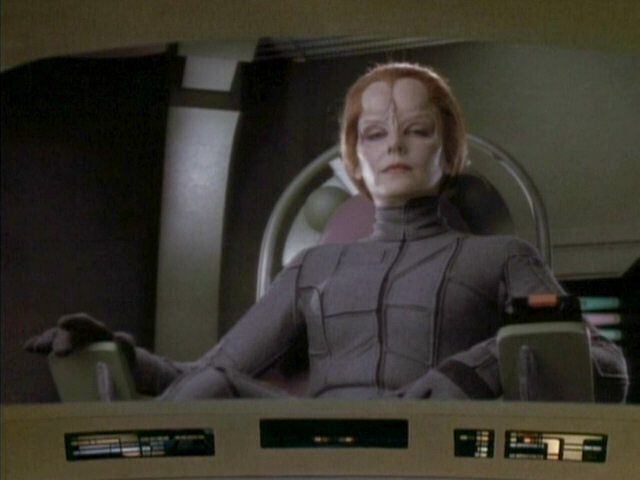 The interior of the Ferengi shuttle features some furniture that would appear several times over the course of the series. 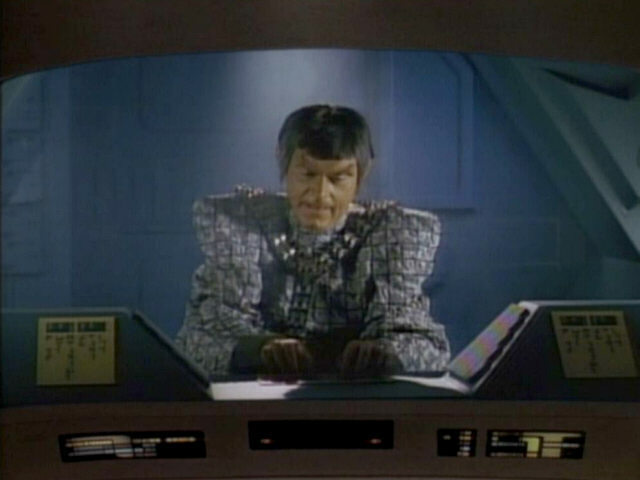 The cockpit console reappears only two episodes later aboard the Romulan scout ship in "The Defector". 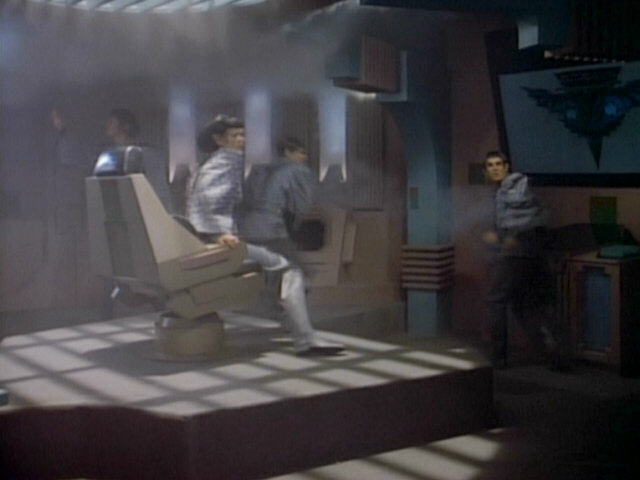 The chairs are later seen on the bridge of the Ktarian ship in "The Game" and on the Romulan Warbirds in "Future Imperfect" and "Face of the Enemy". 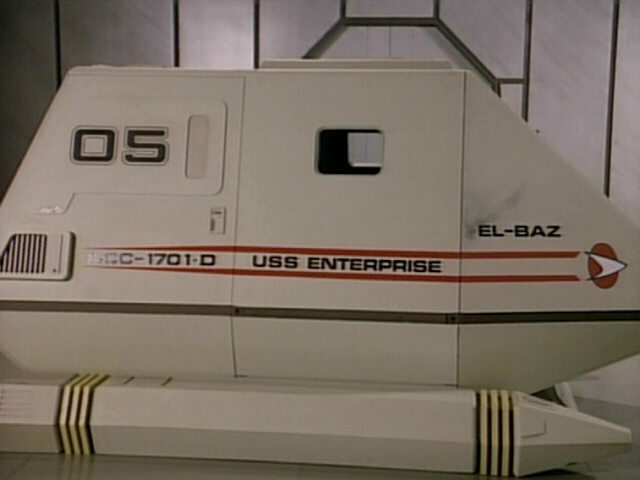 the Enemy" A better look at the inside of the shuttle. 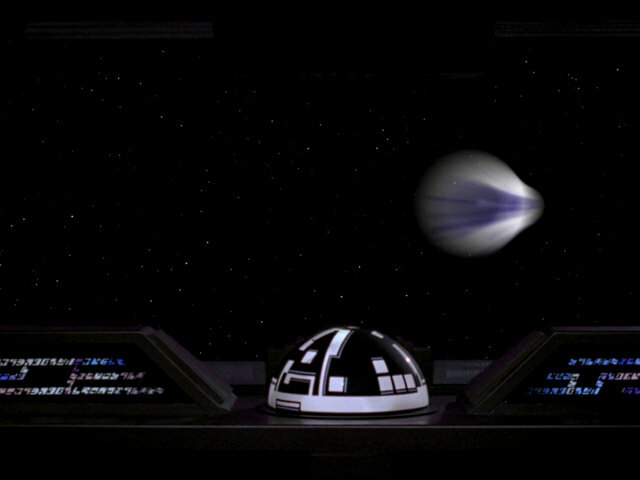 When the same Ferengi shuttle reappears in the VOY episode "False Profits", the interior of the shuttlepod has changed completely and the pod is much larger. 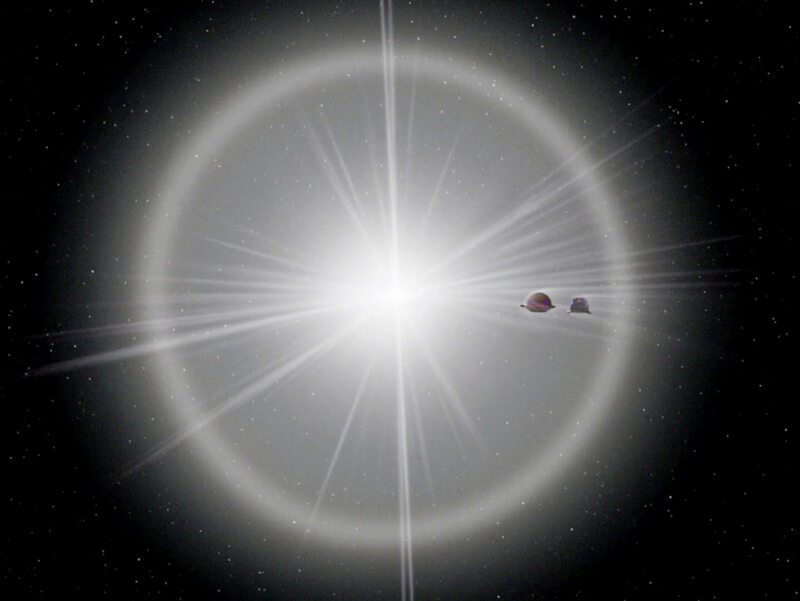 The Barzan wormhole slowly opens. 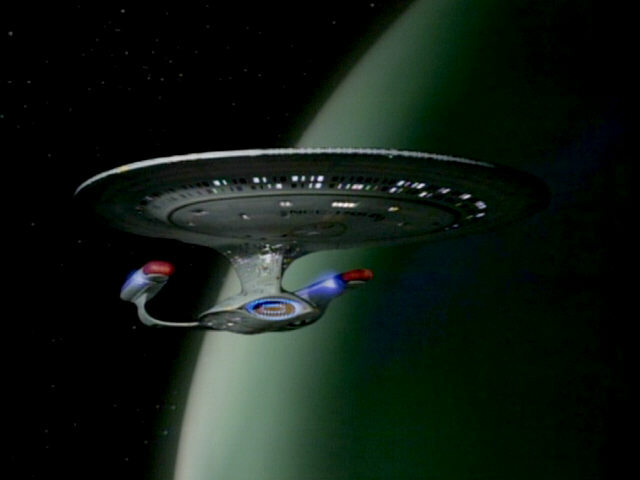 Its appearance is identical to the one earlier in the episode (obviously, because the same effect was used twice). 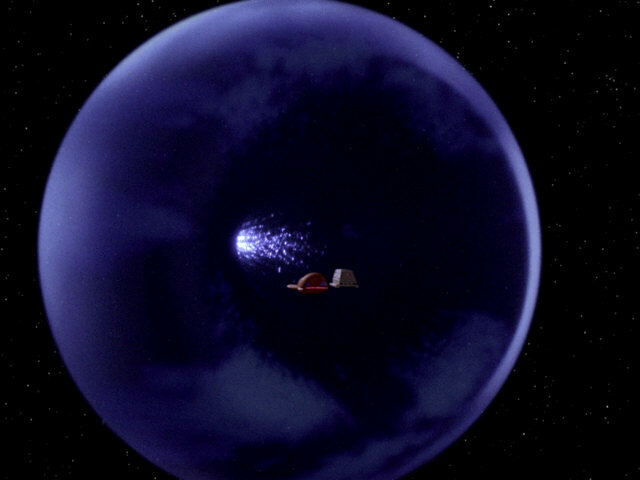 When its other end reappears many years later in the Voyager episode "False Profits", the appearance of the wormhole has changed drastically. 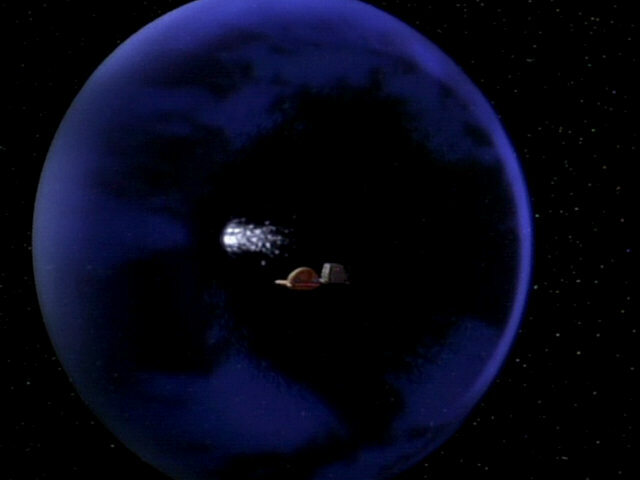 Profits" The features of the wormhole are somewhat better defined in HD. 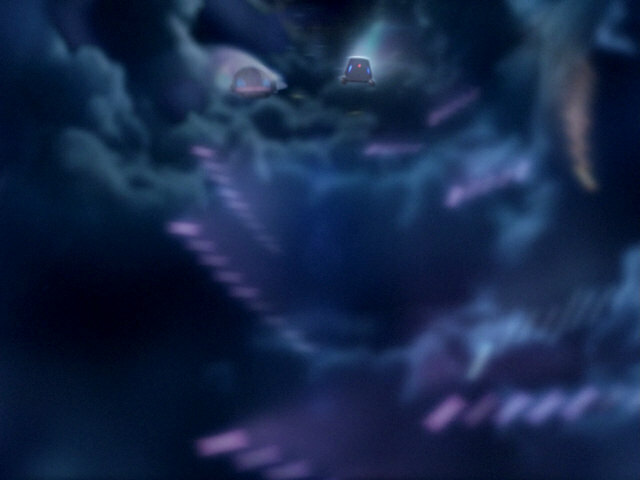 Two more screenshots of the wormhole, showing its three-dimensionality. 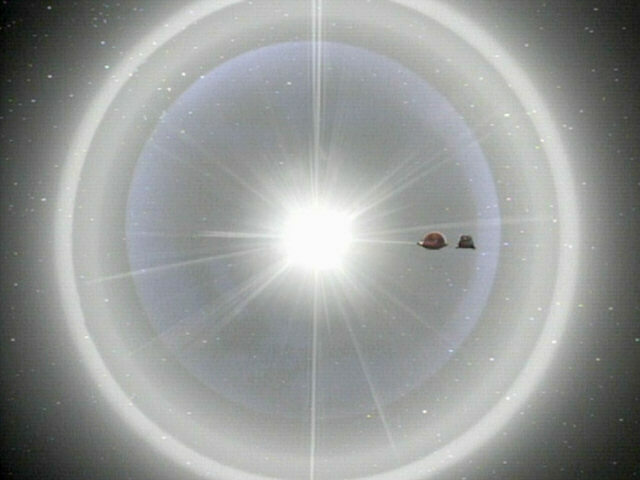 Inside the Barzan wormhole. 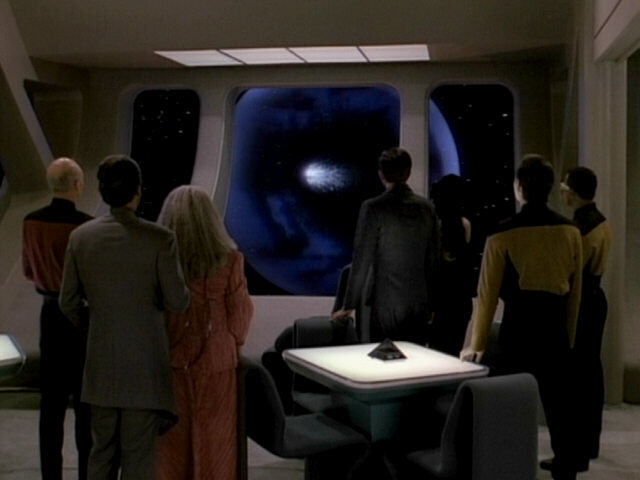 The interior of the wormhole appears completely different in "False Profits" as well. 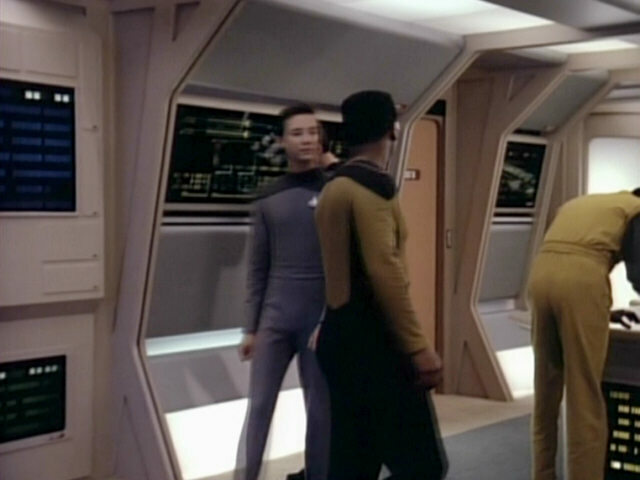 Profits" While it is overall just as blurry, there is less motion blur in the sequence in TNG-R. 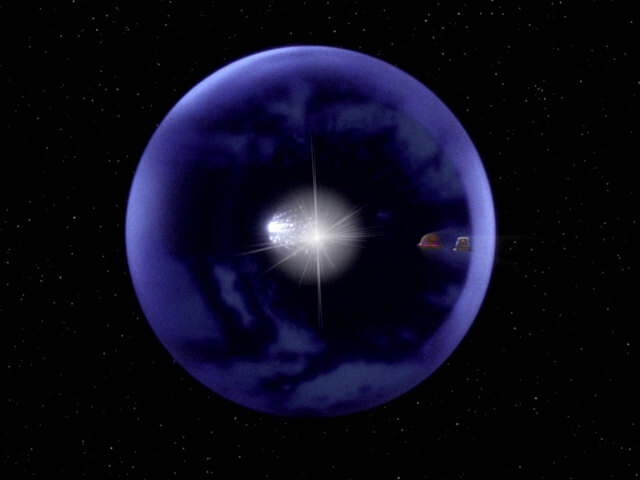 The proposal of the United Federation of Planets for rights to the Barzan wormhole. 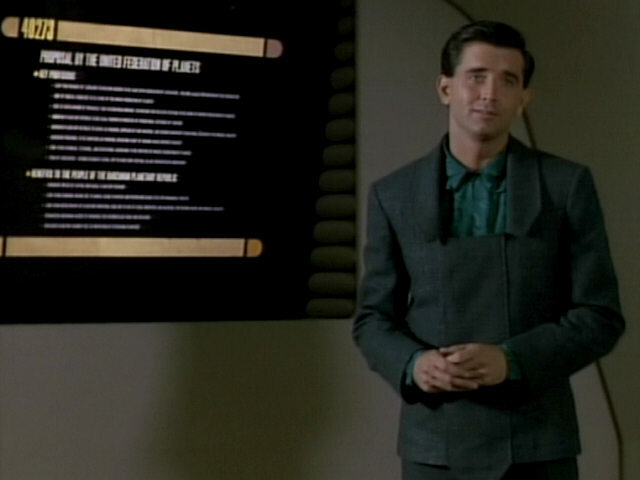 The LCARS display features the number 40273, meaning this is a third season LCARS display. 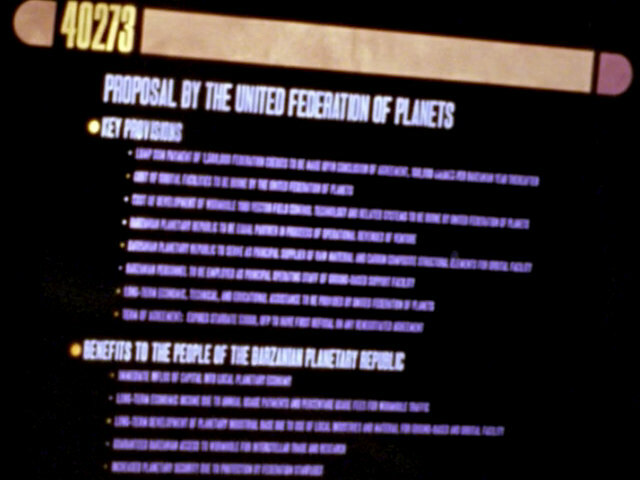 We can almost read the text. 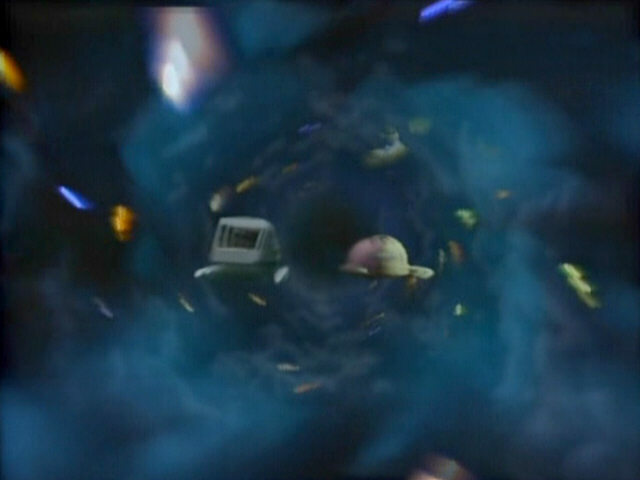 The two shuttlepods inside the wormhole. 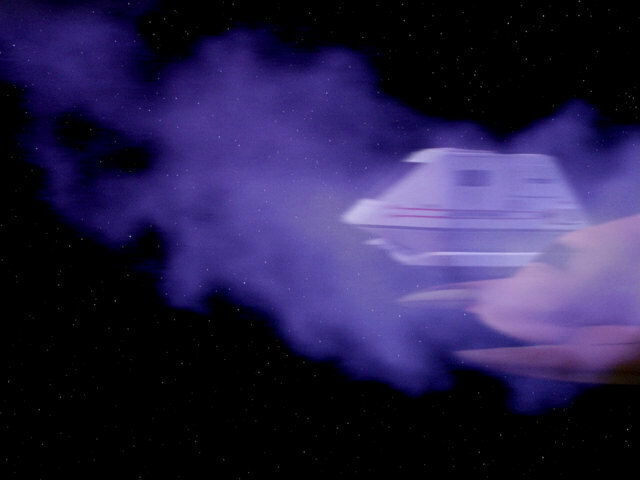 The motion blur has been reduced and the contrast increased in this sequence too. 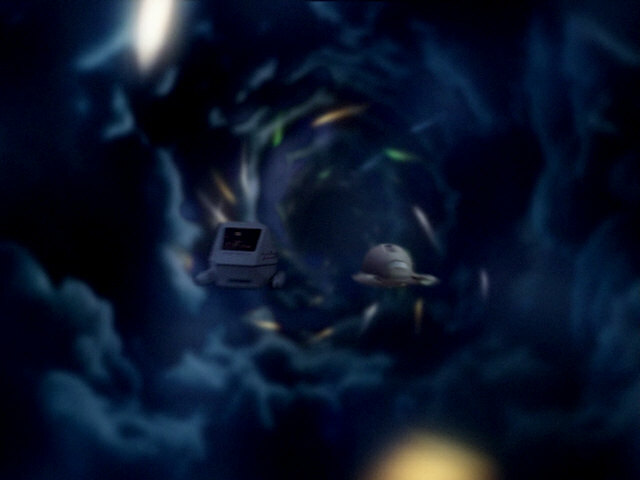 The two shuttlepods leave the Barzan wormhole. 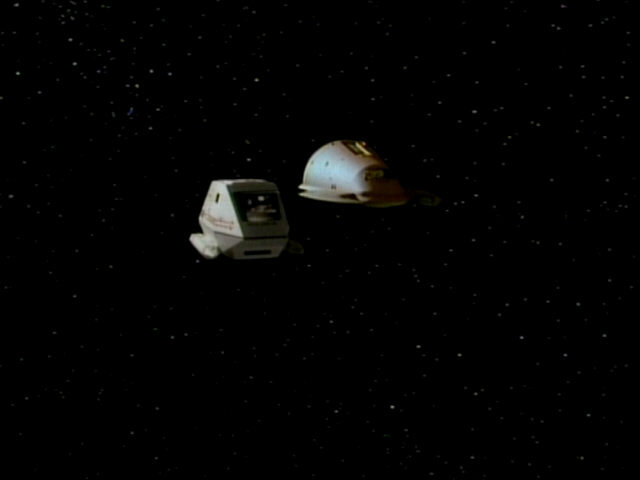 The two shuttlepods next to each other. 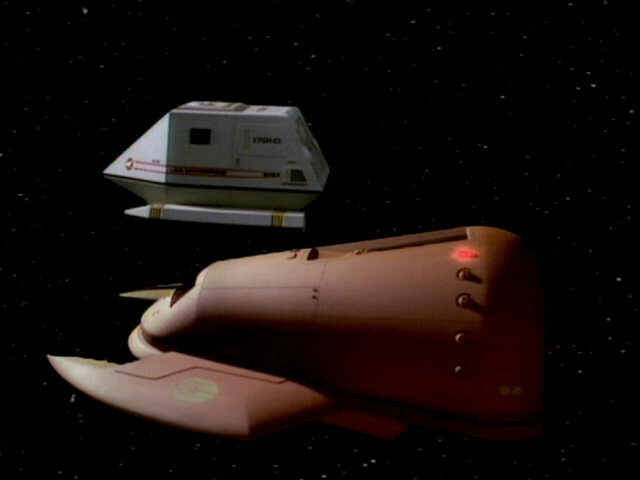 In the first shot, the filming miniature of the Type-15 shuttlepod was used, in the second shot, the full-sized model of the shuttlepod set was used. 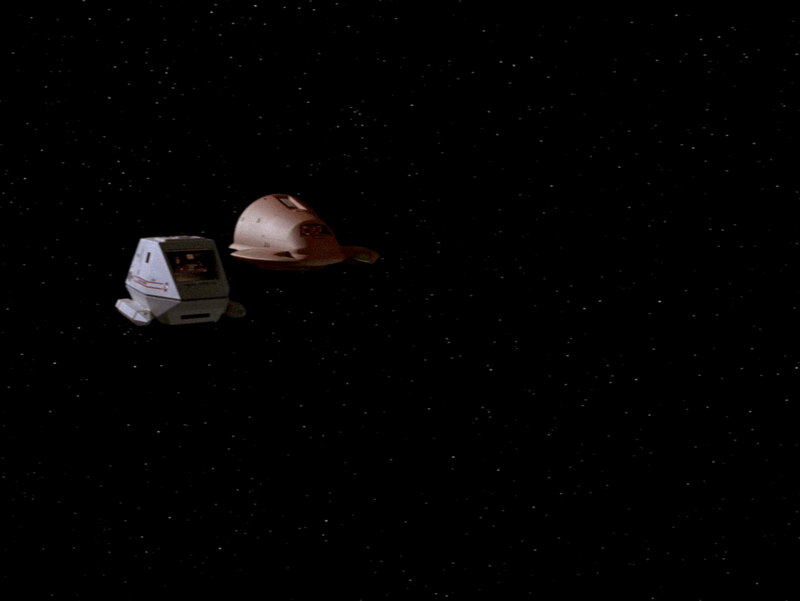 The shot with the life-size pod looks awesome in HD. 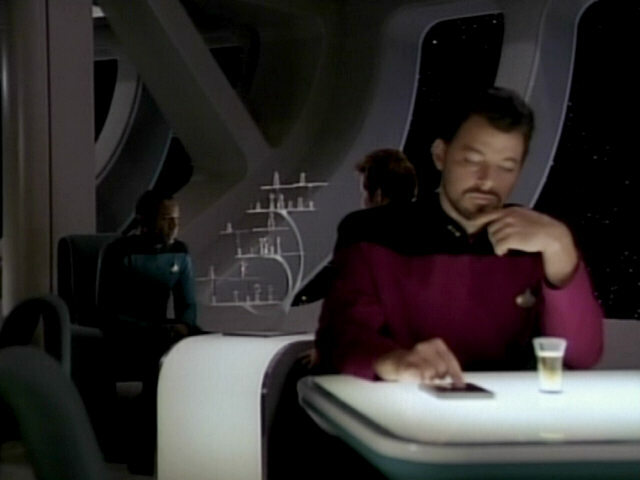 The exercise room is a redress of the part of main engineering normally featuring the MSD and pool table. 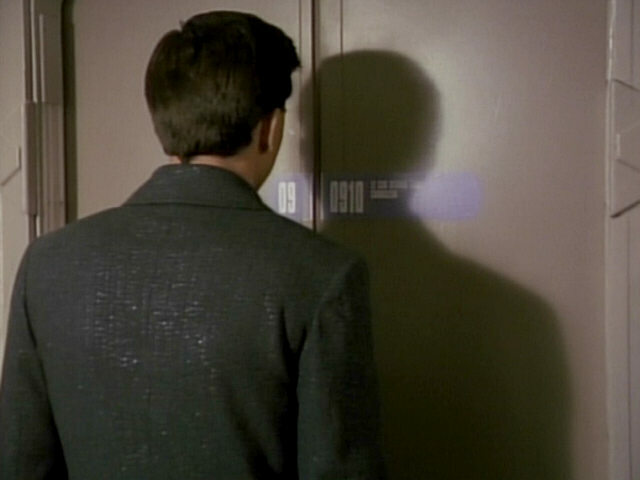 The MSD was hidden behind a large mirror but the curved lights to the left and right of it and the corridors that lead to the sides are still visible. 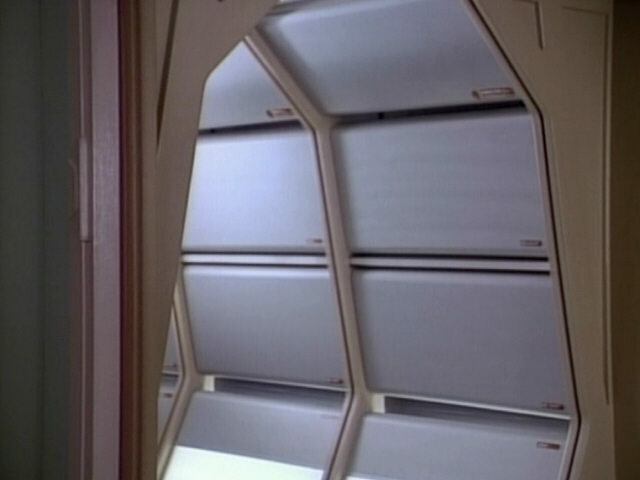 In addition to that, the large LCARS displays on the slanted side walls were covered with a silver wall panel similar to the lower and upper ones. 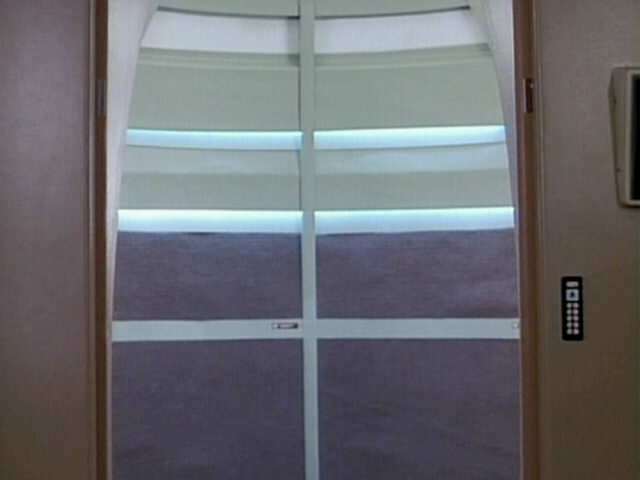 The alcove housing the turbolift door can be seen at the right side of the screenshot. 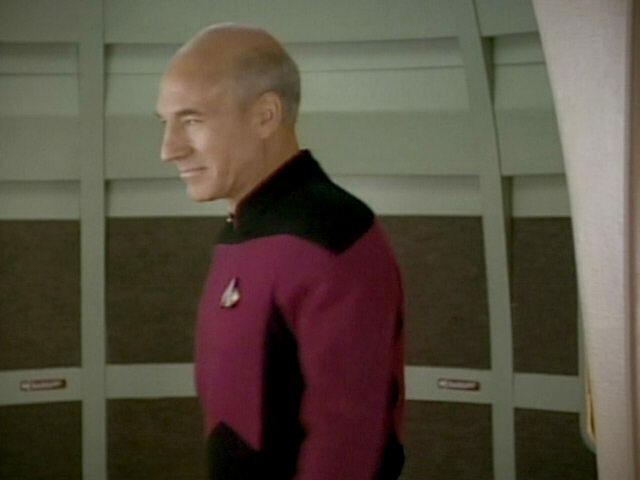 The second mirror is put right before where the corridor plugs normally are normally placed. 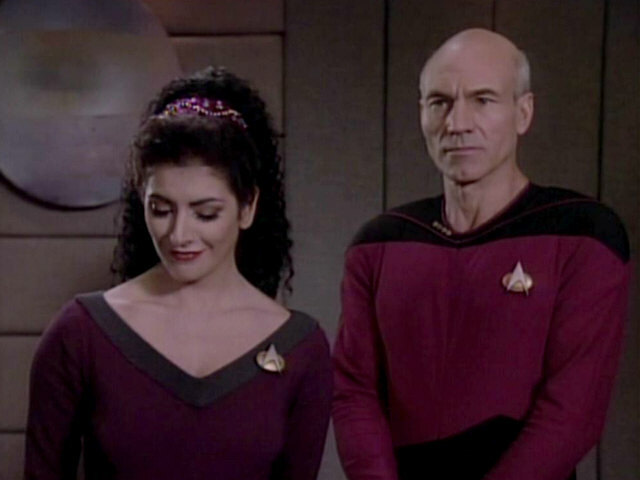 Something has changed in this shot. 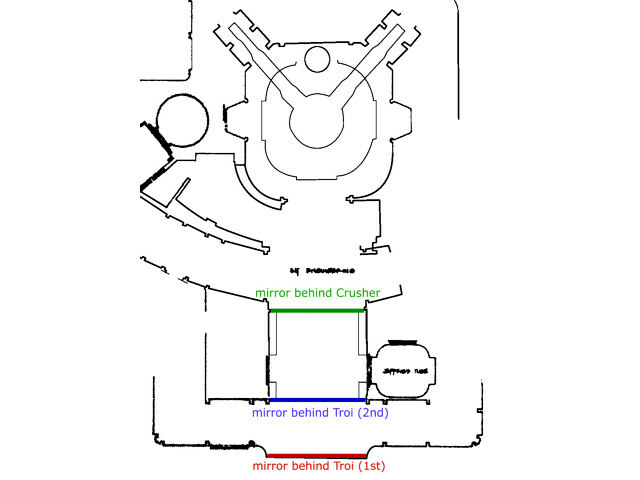 It seems the mirror directly in front of the MSD was moved closer to the other mirror, so the lights to the right and left of the MSD and the corridors leading to the sides are no longer visible. 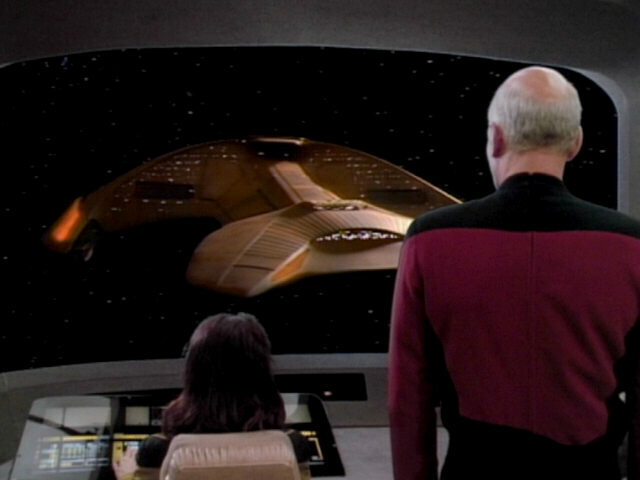 This is only true for the screenshots featuring Troi, however, as the reflection of the two lights can still be seen in the shots with Crusher. 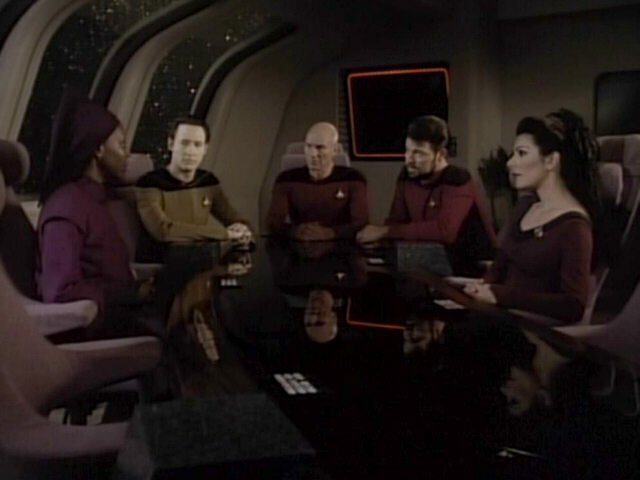 The Pair Match game, often seen on Ten Forward tables, is seen up close in this shot again. 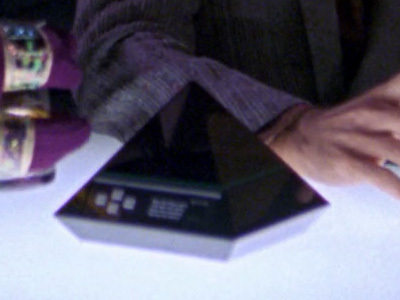 Present-Day Devices as Props A close-up of the pyramid in HD. 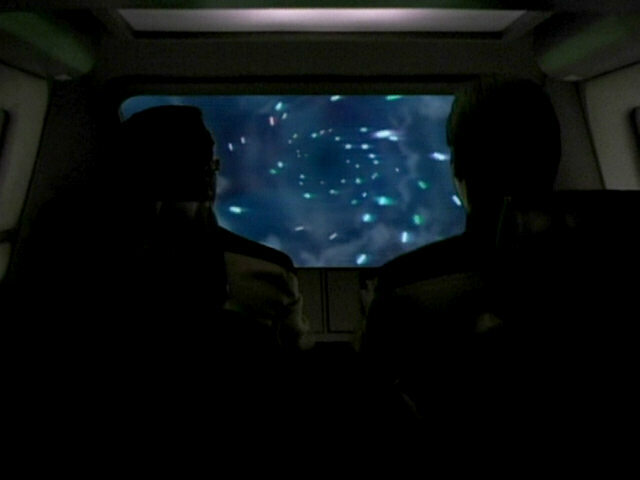 The interior of the Barzan wormhole as seen through the cockpit window of the shuttlepod. 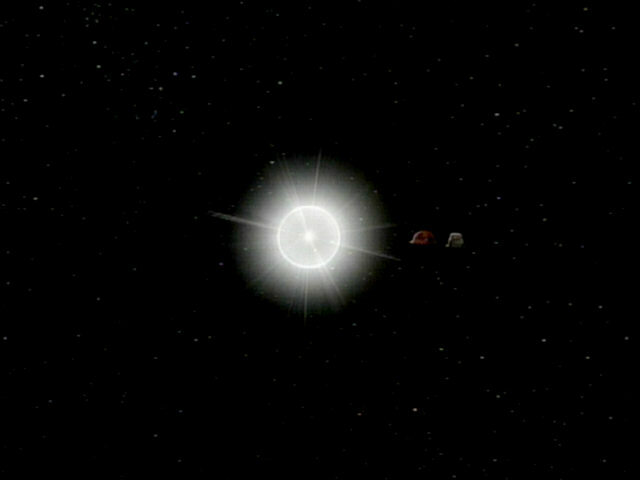 The effects are much the same in HD as in the original. 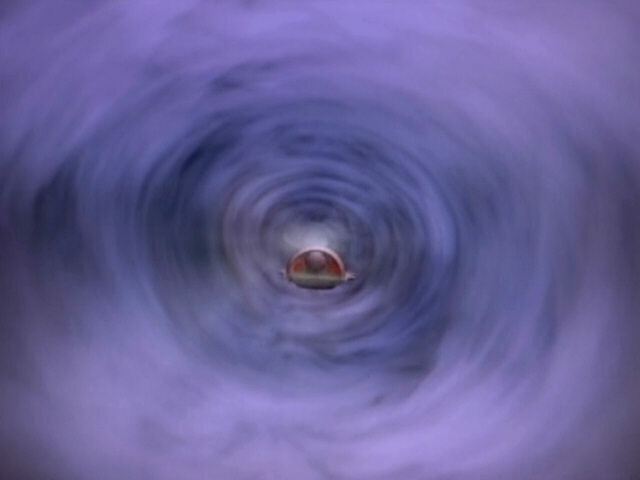 The Barzan wormhole moves position, as seen through the cockpit window of the Ferengi shuttle. 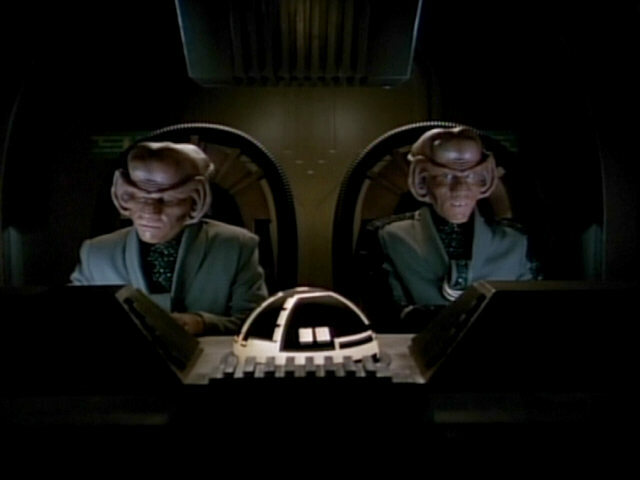 The dome at the center of the console is characteristically Ferengi. 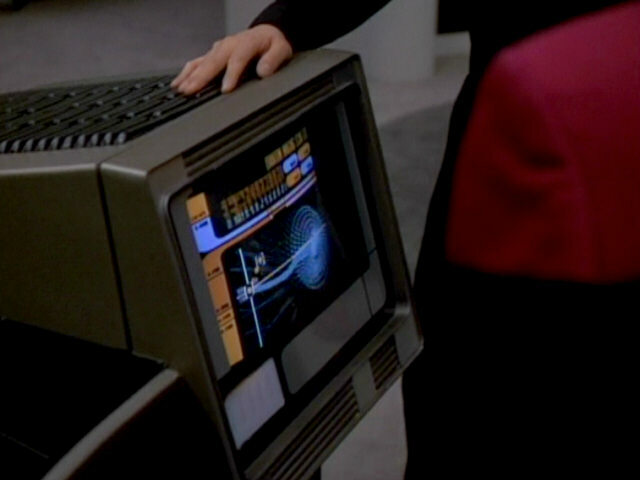 Domed interfaces like this first appeared in season 2's "Peak Performance". 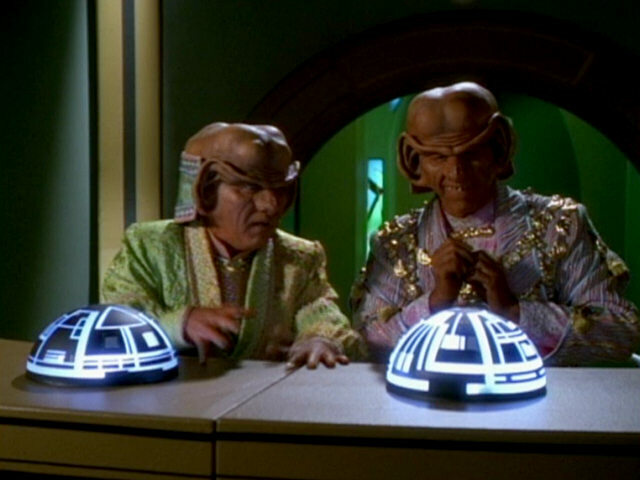 These domes had not been introduced in season 1, but they seem to echo the Ferengi thought maker seen in "The Battle". 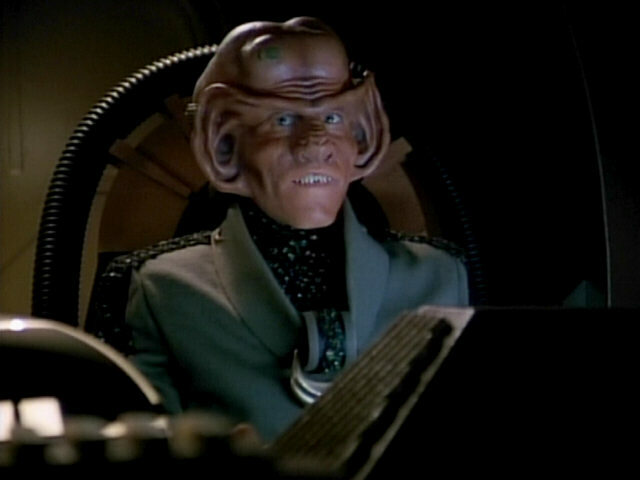 Ferengi writing also debuted in that episode. 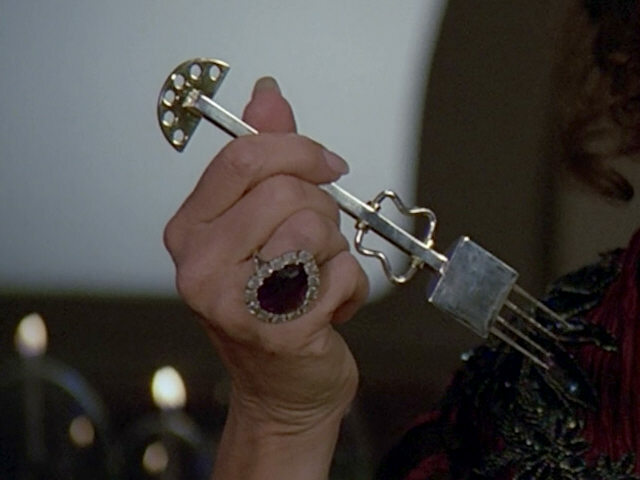 The ornate cutlery was last seen in "Manhunt" when the elder Troi woman, Lwaxana, was having dinner with Captain Jen-Luc Picard. 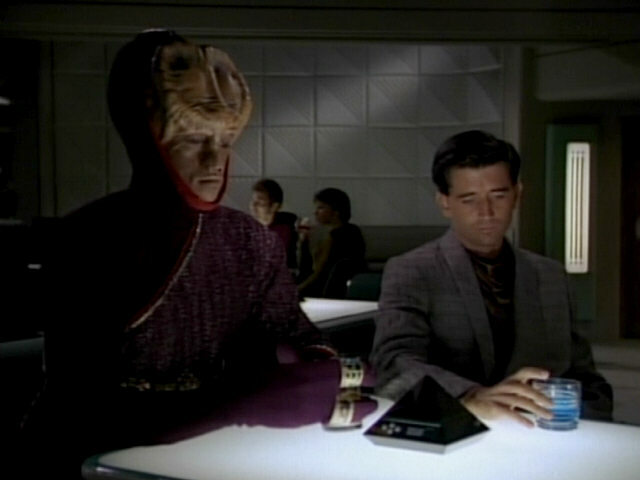 Like the previous two, this shot of Barzan II also is a re-use from "Unnatural Selection". 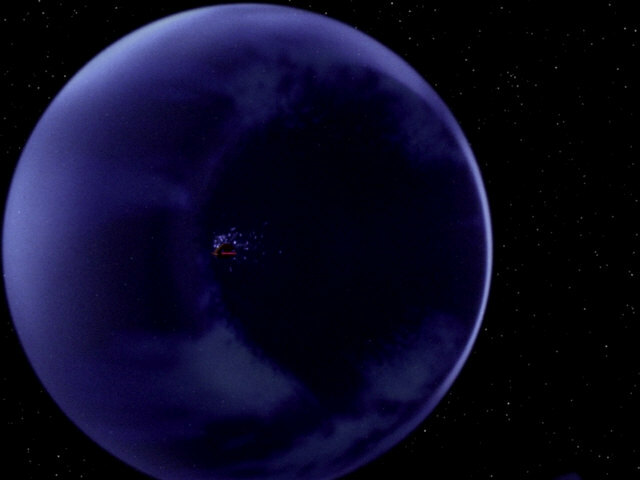 Yet another look at the revised planet. 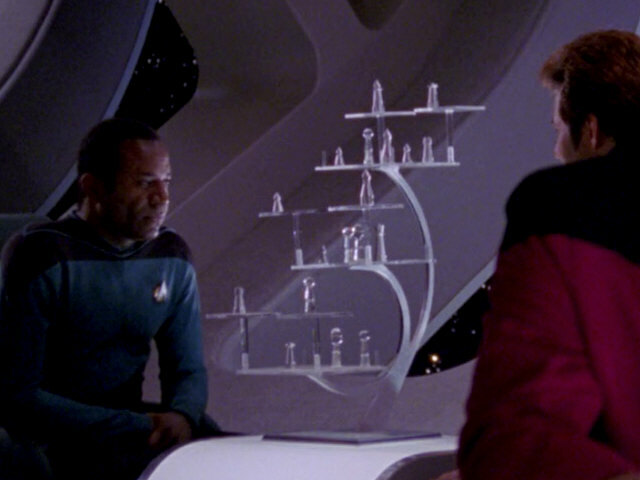 The 3D chess set is prominently seen in this Ten Forward shot. 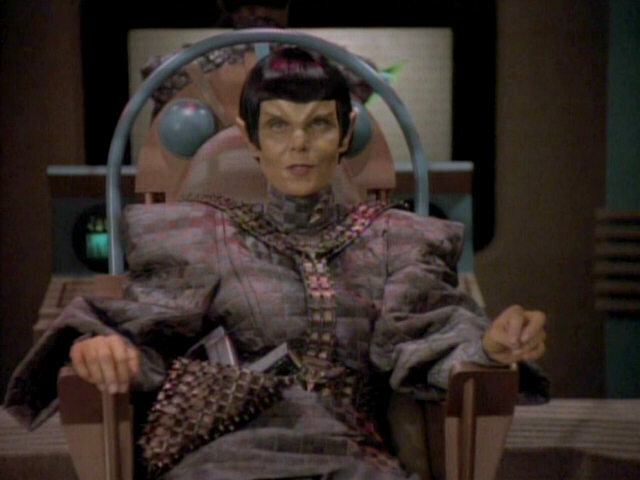 In HD, the silver and glass chess pieces can be seen much better. 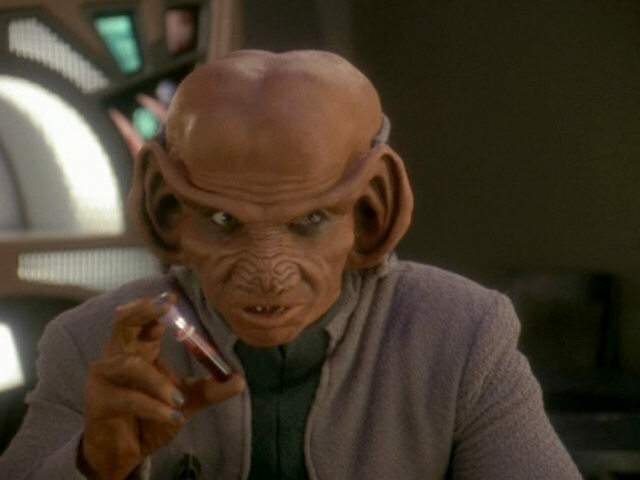 This shot of the Ferengi Marauder was originally created for "Peak Performance". 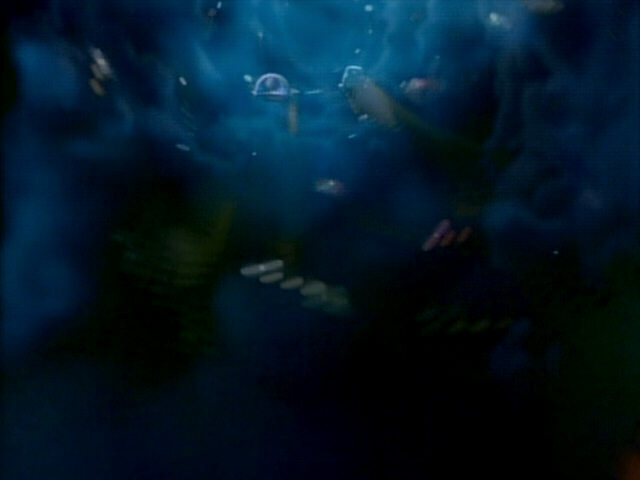 Performance" The Marauder in HD. 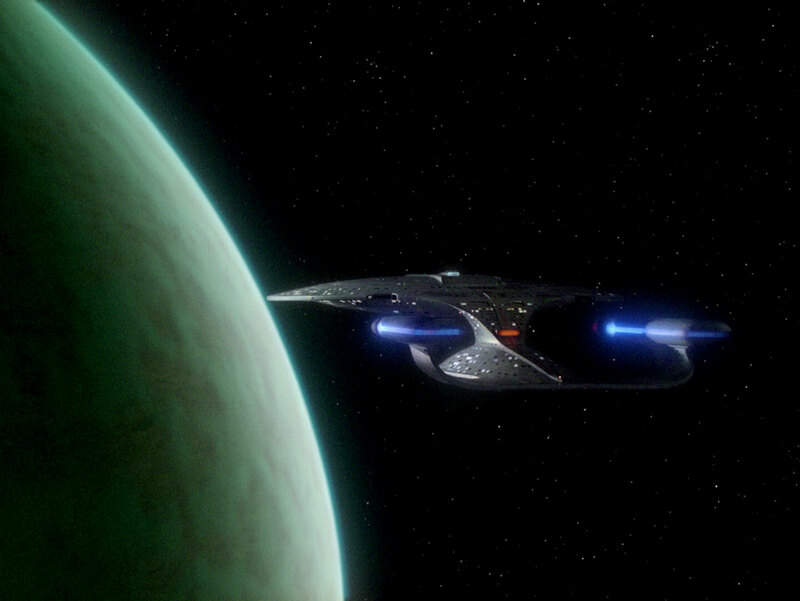 The bridge of the Ferengi Marauder has not changed much since it was last seen in "Peak Performance". The lighting was modified (red instead of green) but the consoles and the rest of the room are still the same. 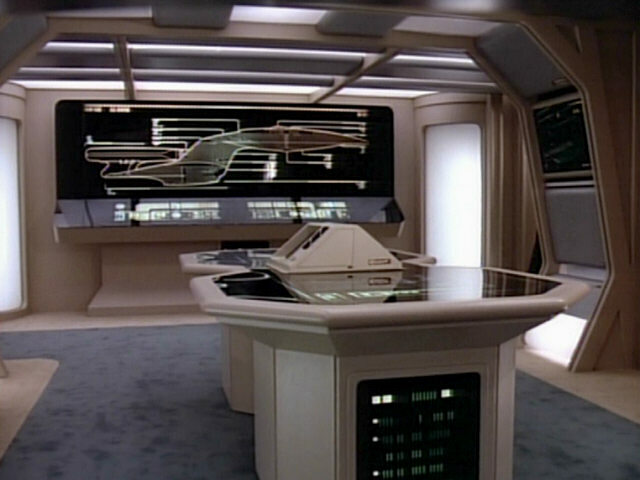 The consoles in the background have been seen in countless Star Trek episodes and films in the past, such as "Star Trek II: The Wrath of Khan" and "Contagion". 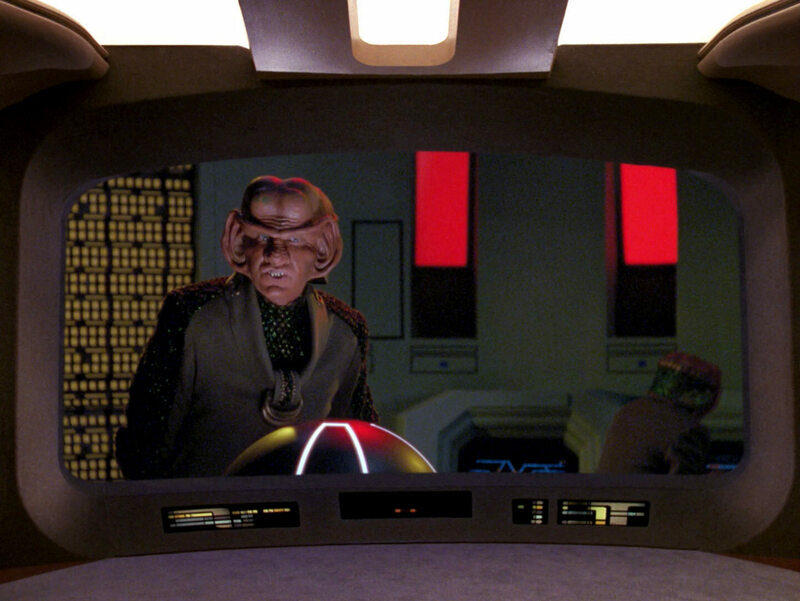 "Contagion" A good look at the Ferengi bridge in HD. 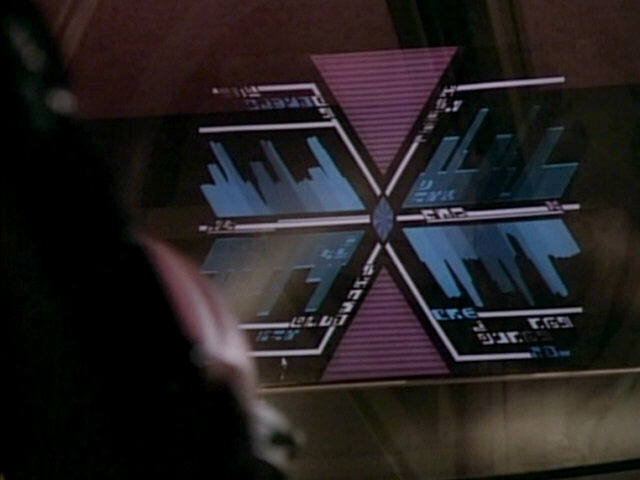 A graphic of the Barzan wormhole is displayed on one of the aft bridge monitors. 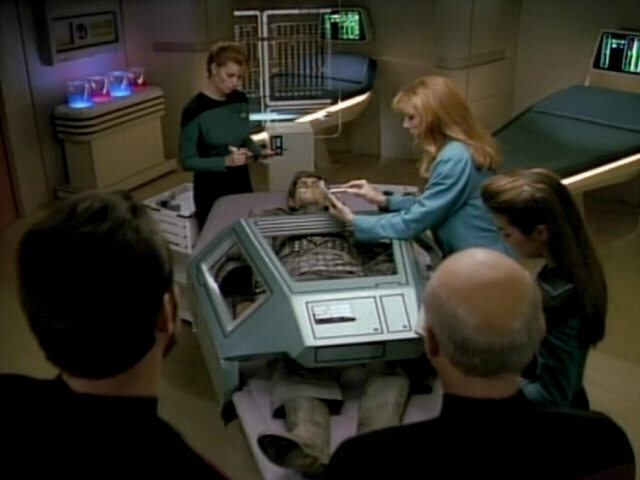 The graphic is different in the VOY episode "False Profits". 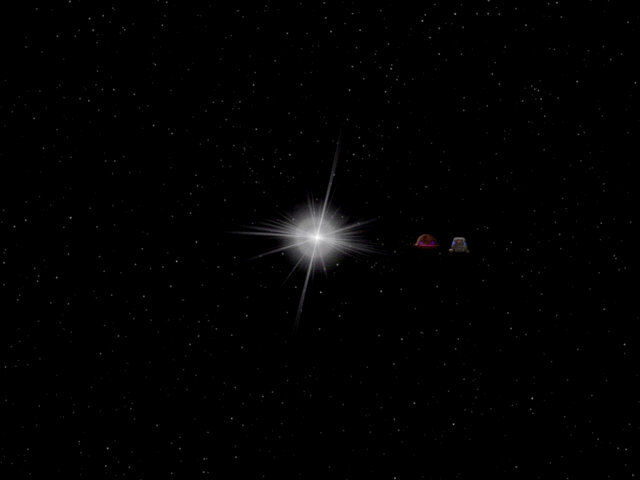 Profits" An HD close-up of the display. 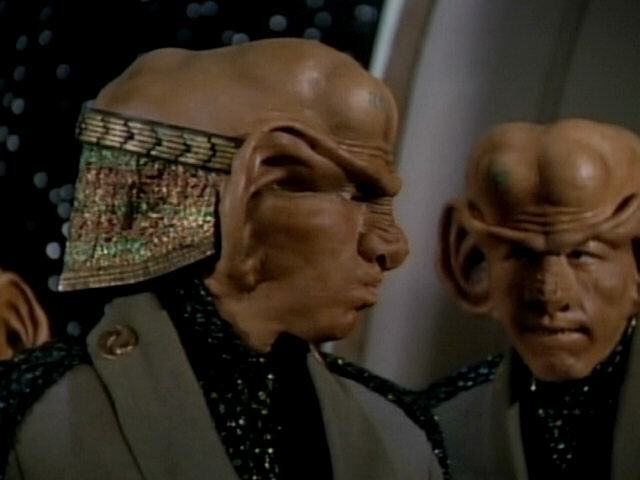 This is what Ferengi missiles look like. 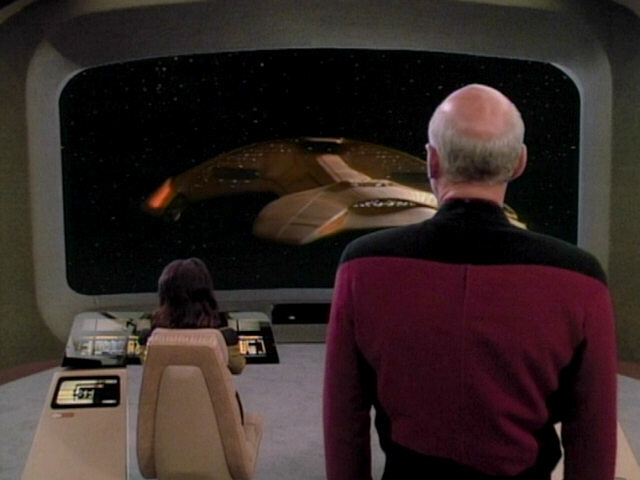 The effect is just a light in TNG-R as well. 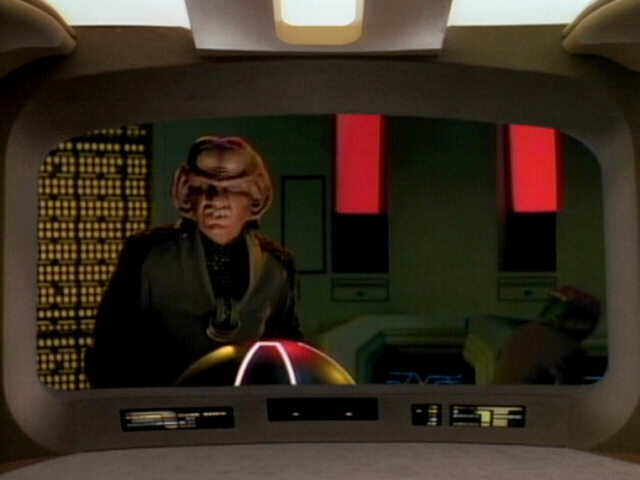 Unlike in "Q Who", when the observation lounge was also seen during a red alert, the rim of the viewscreen in the lounge doesn't flash red. 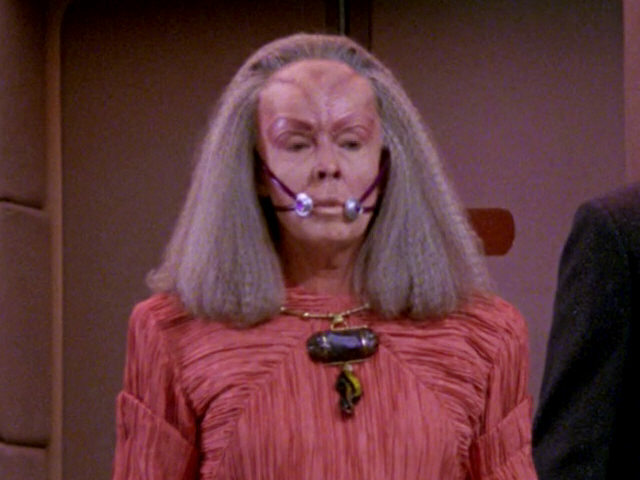 Premier Bhavani's dress and jewelry were later worn by Ambassador Taxco in the DS9 episode "The Forsaken". 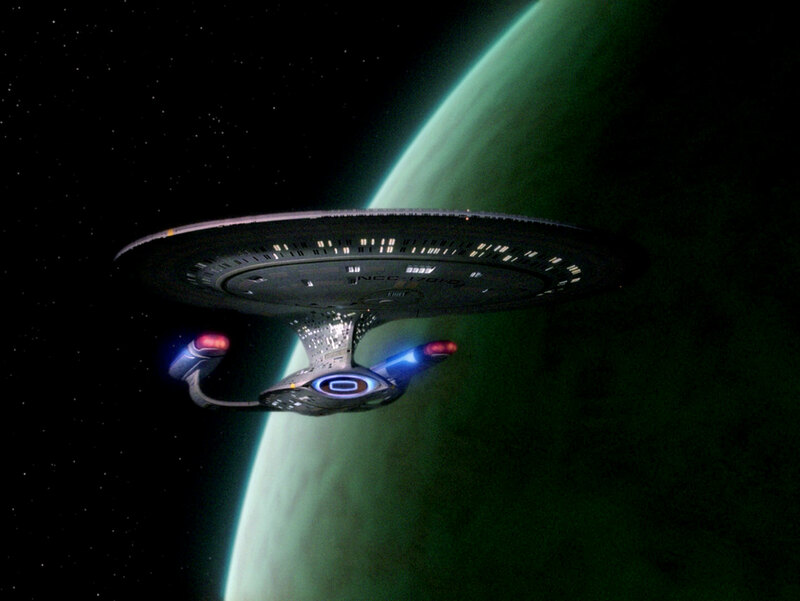 For the re-use on DS9. 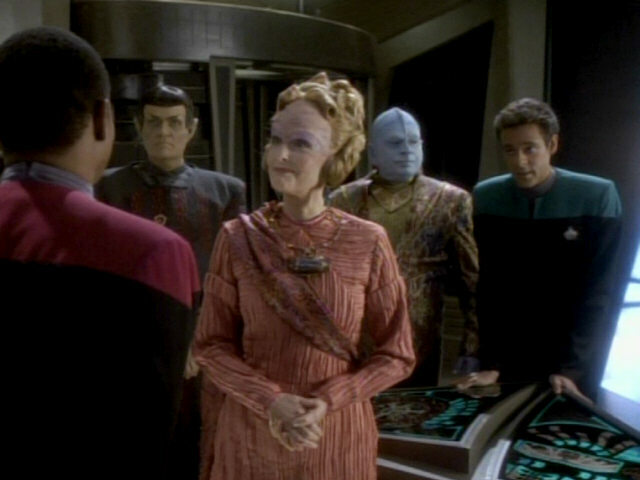 A colorful sash was added, the large belt made from the same fabric as the dress was removed and the dangling, golden part of the necklace was removed. 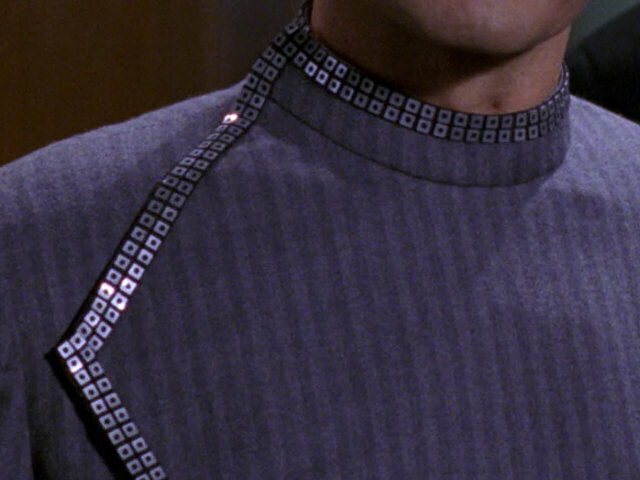 "The Forsaken" A close-up of the necklace in HD. 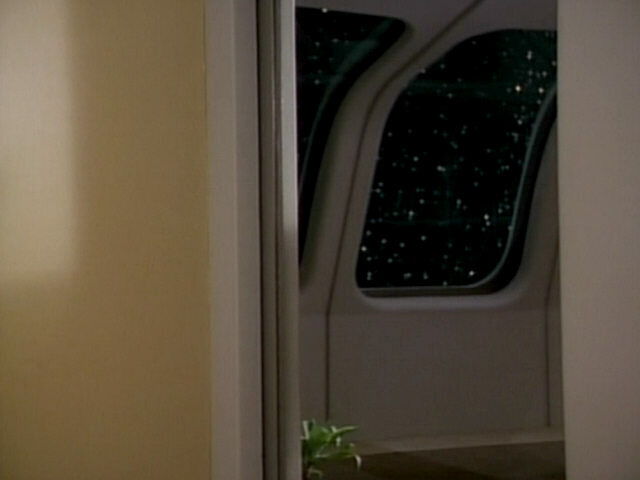 The door label to Troi's quarters was (falsely) seen on Salia's guest quarters in "The Dauphin". 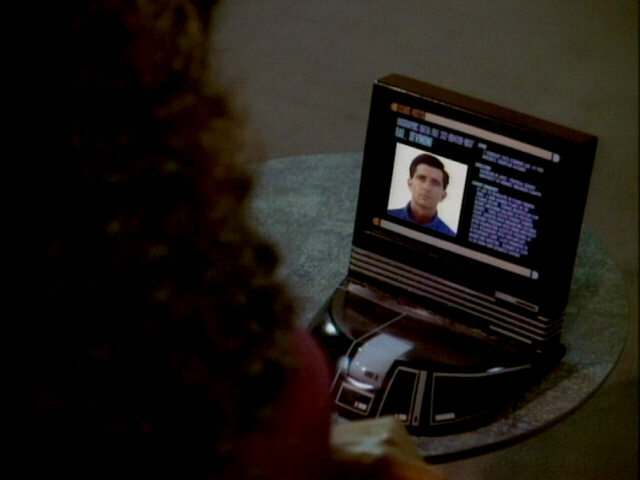 "The Dauphin" The job title "Counselor" has been added to the label, as the HD screen cap reveals.